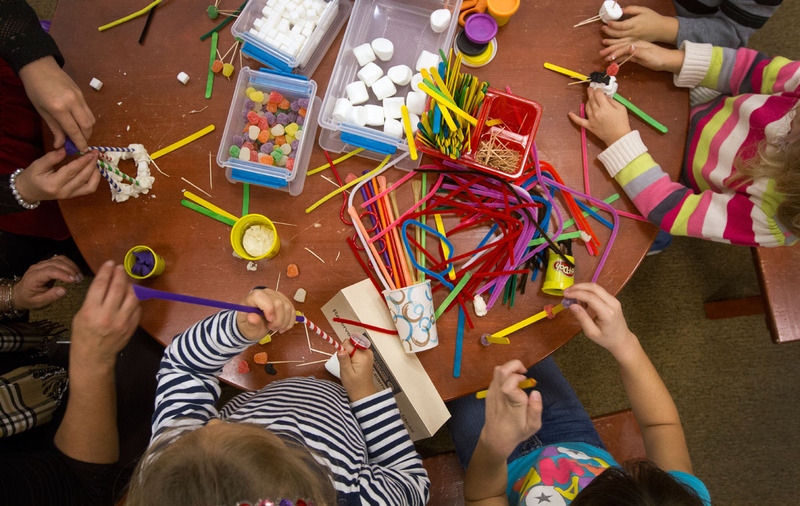 Fall and winter at The Center for Gifted Studies are full of younger students with our Super Saturdays and Little Learners, Big Ideas programs. 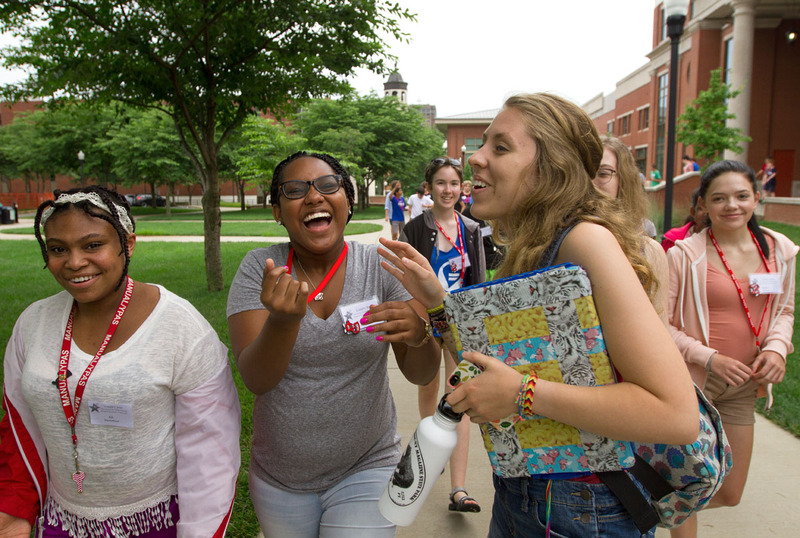 Ali Shackelford (from left) of Louisville, To’Nia Beavers of Bowling Green, and counselor Ellie Hogg laugh about something that happened during dinner while walking back to Northeast Hall after eating. 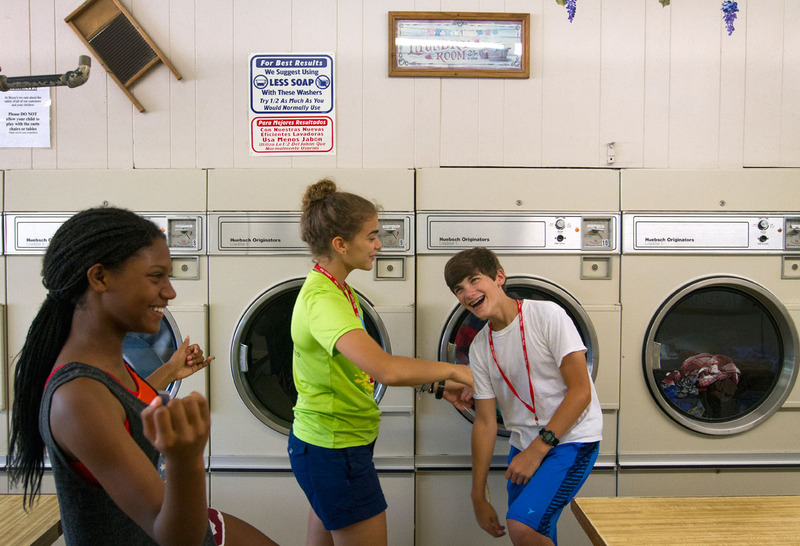 Jocelyn Martin (from left) of Russell and Maya Abul-Khoudoud of Ashlandteach a dance to Grant Coorssen of Louisville while waiting for their clothes to dry at Bryce’s Bypass Laundromat Sunday, July 10. 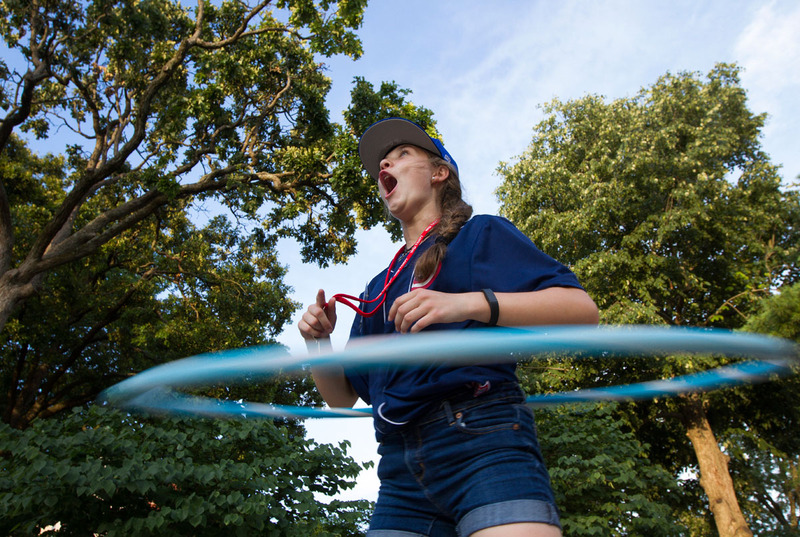 Chloe Banaszak of Crestwood hula hoops behind Northeast Hall during Mandatory Optionals Tuesday, June 28. 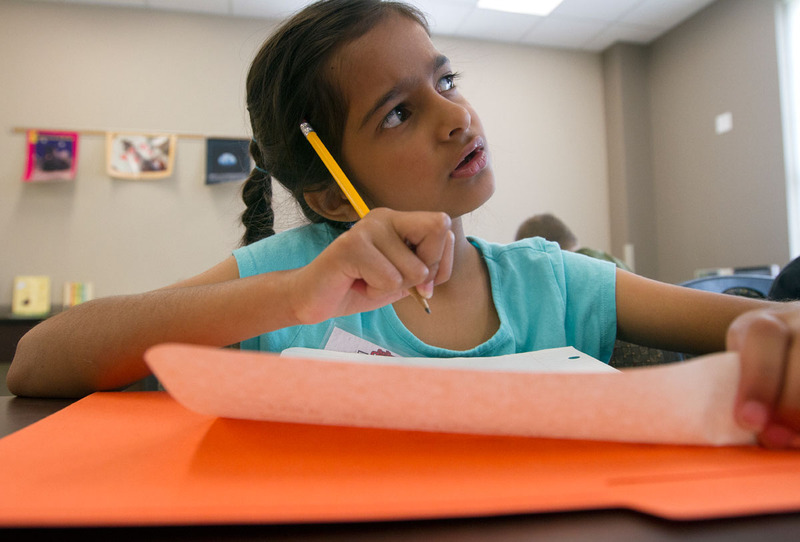 Anjali Gaba ponders her story while writing it out during Language Arts Monday, July 11. 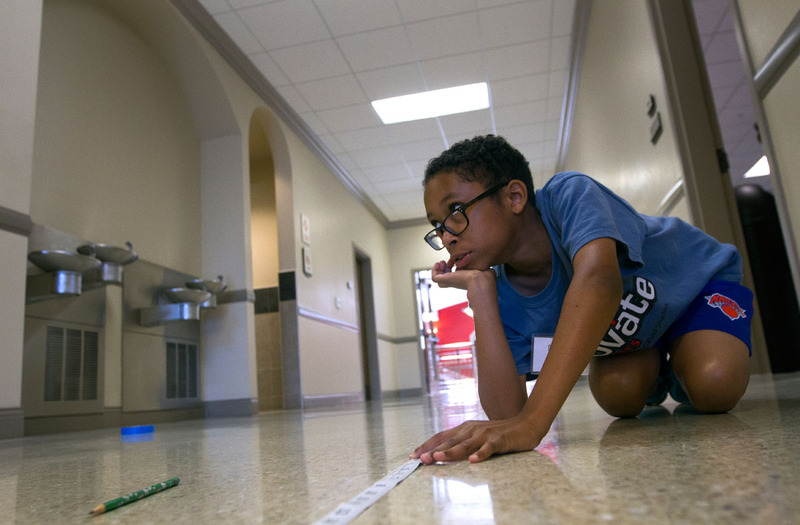 Karson Green holds a measuring tape while his partner takes a measurement during Math at Camp Innovate Monday, June 6. 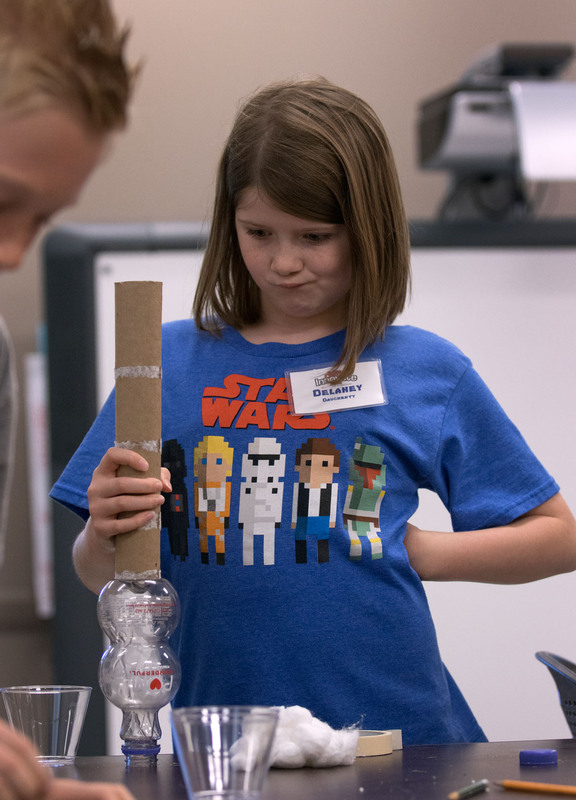 Delaney Daugherty contemplates the construction of her prototype in Science at Camp Innovate Wednesday, June 8. 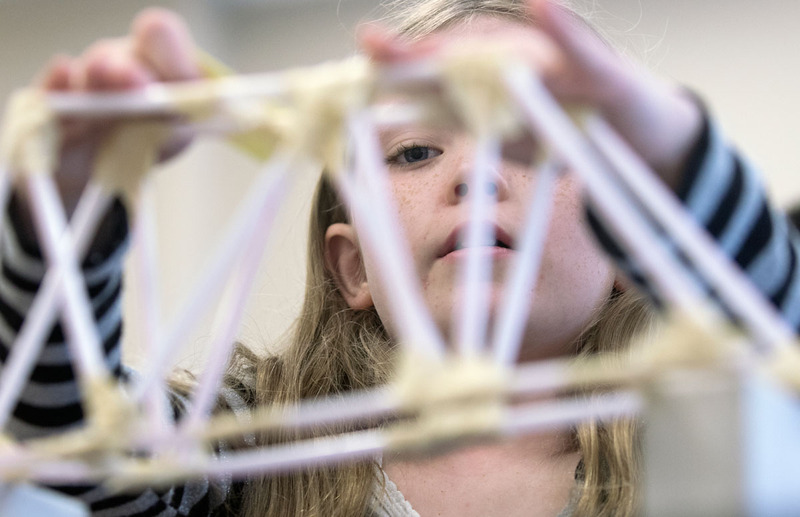 Students chose a real-world problem, invented a device to solve the problem, and built a prototype of their device. 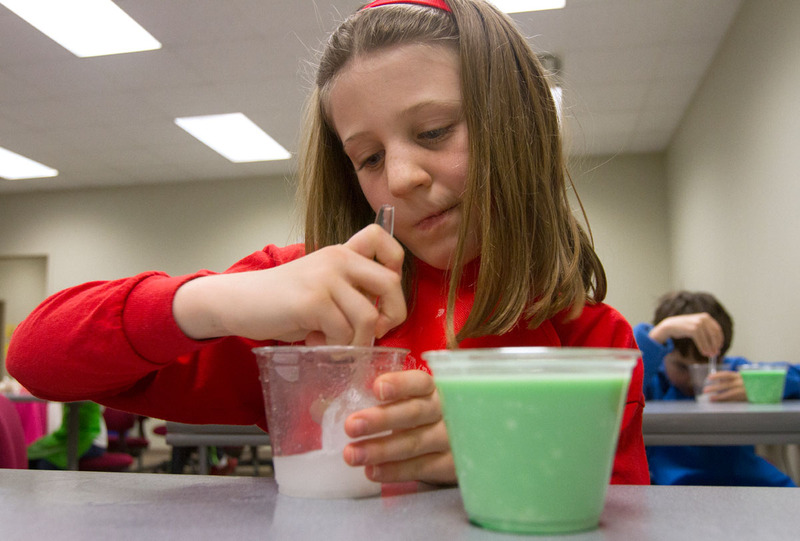 Delaney’s invention was intended to clean drinking water and regulate its usage. 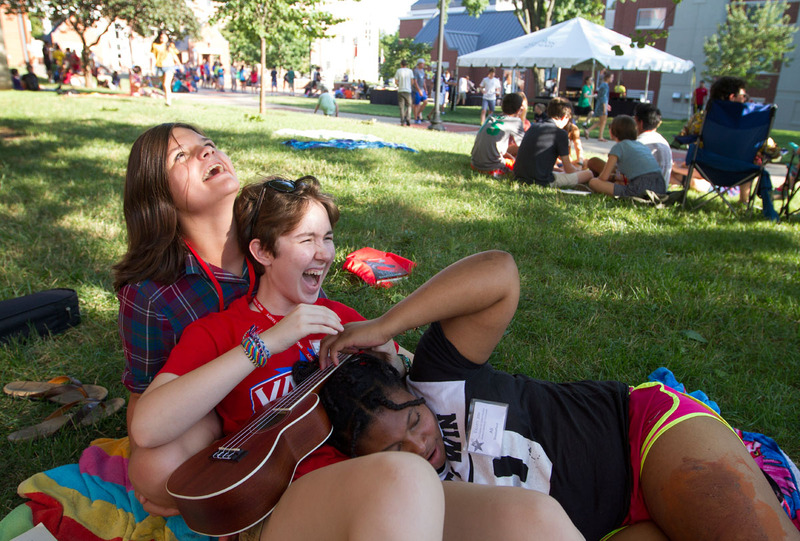 Laine Hirn (from left) of Louisville, Zoe Ward of Frankfort, and Ali Shackelford of Louisville share a laugh during the cookout Sunday, July 10. 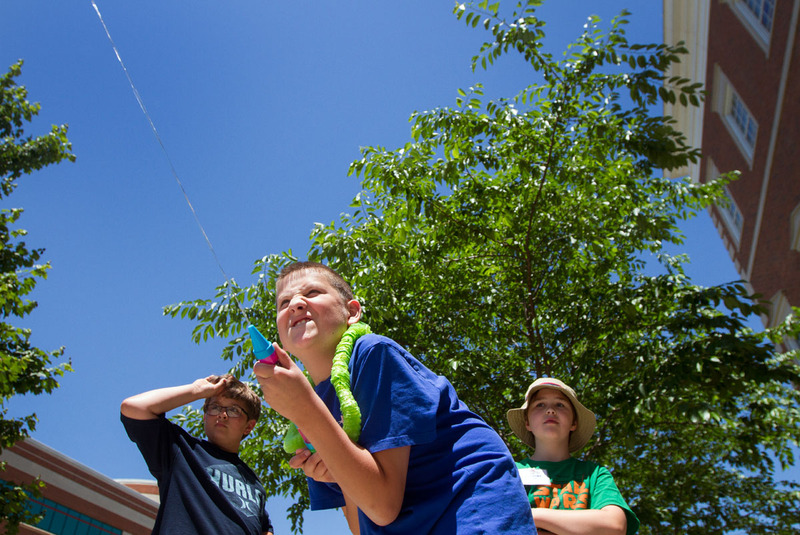 Destry Miller squirts a water launcher as his group members Christian Kantosky (left) and Anthony Counts watch during Math at Camp Innovate Monday, June 6. 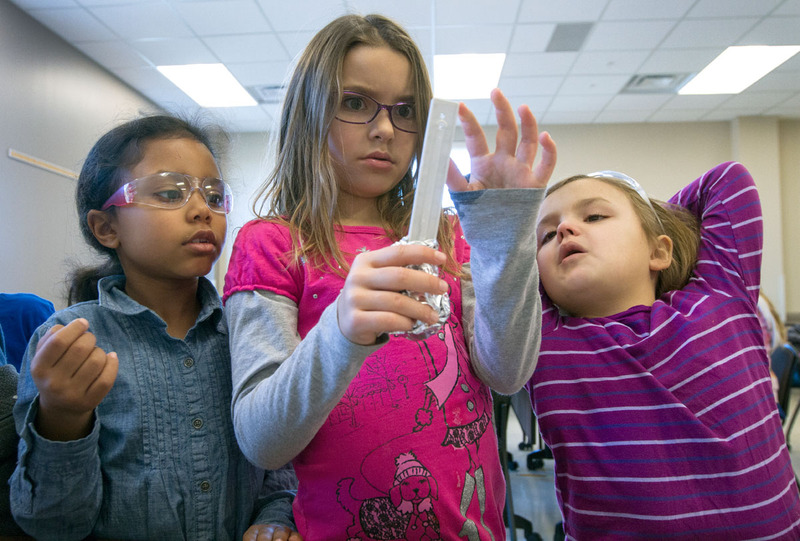 The students used various water tools and took measurements to find which sent water the furthest. 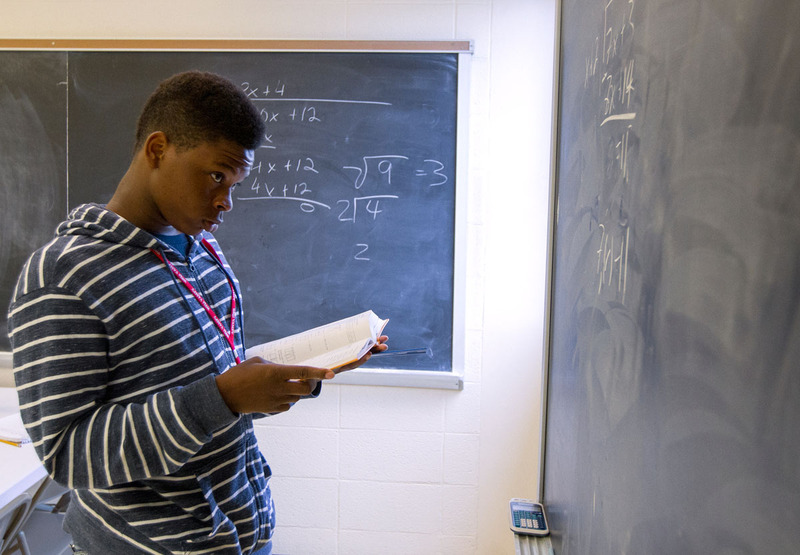 Ni’Kerrion McDonald of Lexington works out a problem on the chalkboard in Mathematics Friday, July 1. 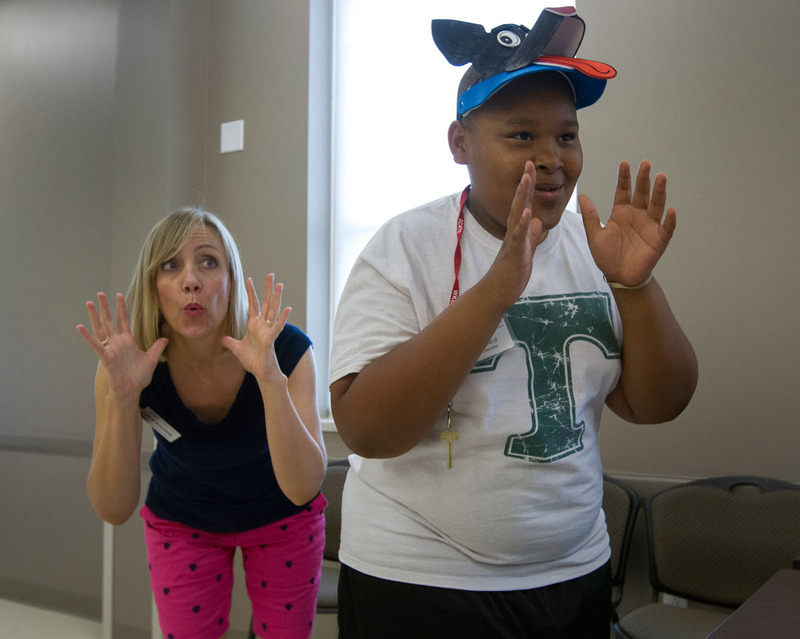 Kennedy Moore acts out stroking the hairs of her chinny, chin, chin while portraying a pig in the “Three Little Pigs” during Math Monday, July 11. 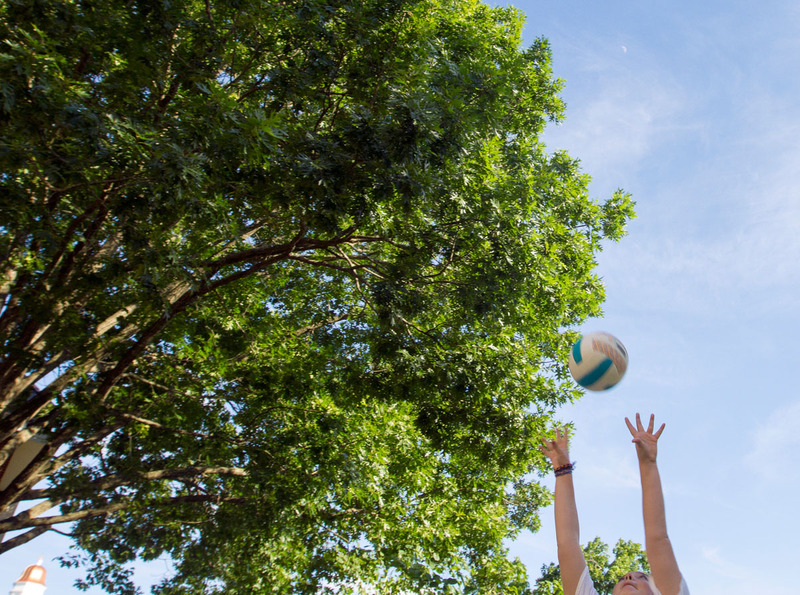 Anna Youngblood from Paducah sets a volleyball to another camper during the cookout Sunday, July 10. 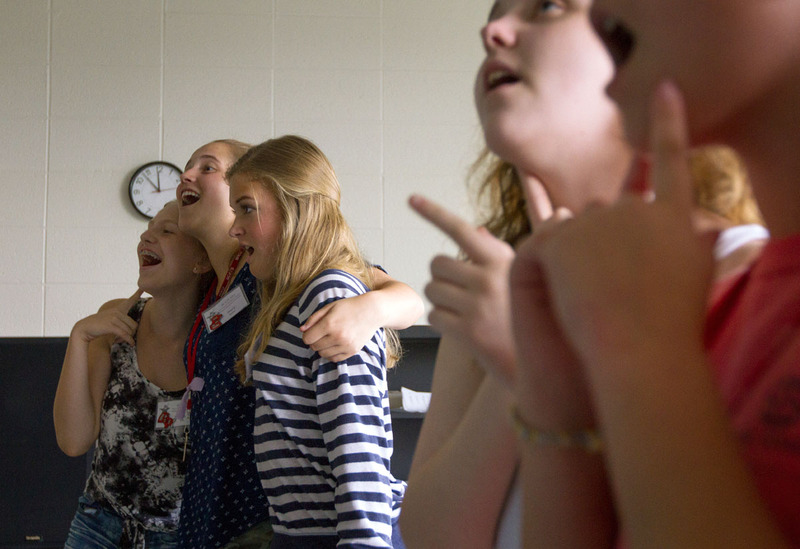 Guest speaker Chris Graney points out constellations and planets to the NSCF Scholars Wednesday, June 8. 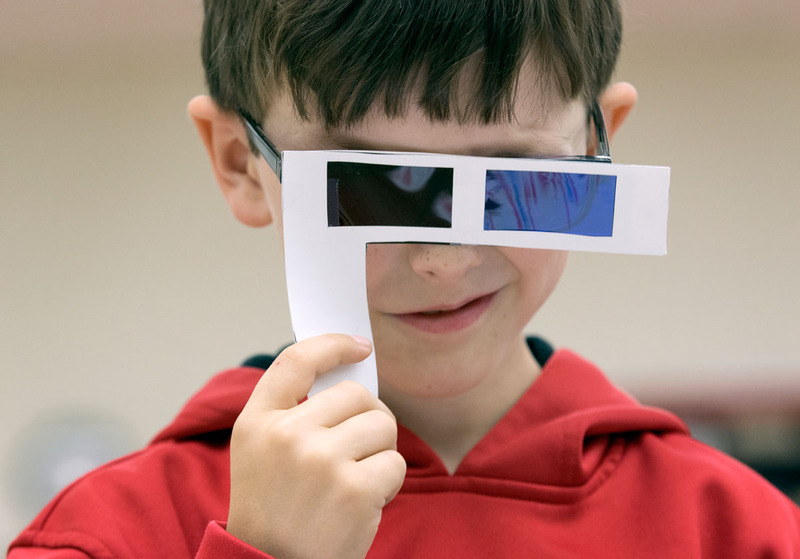 Chris is a professor of astronomy and physics at Jefferson Community and Technical College in Louisville. 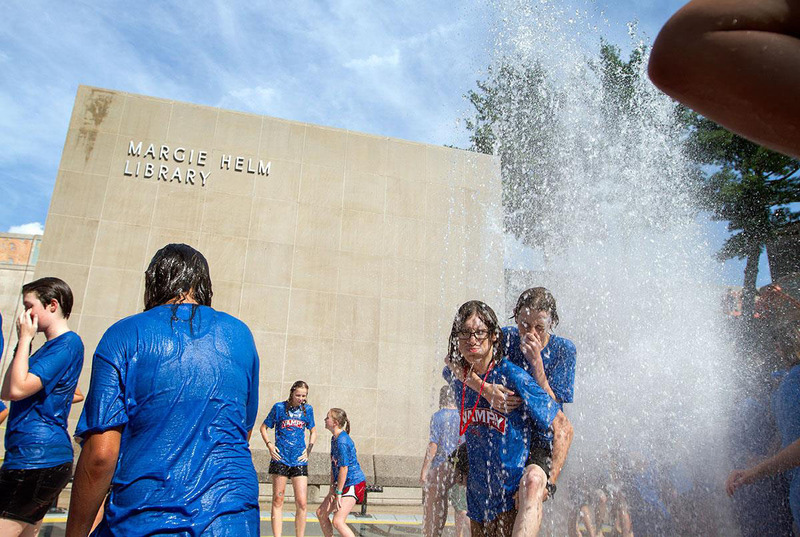 Campers take the traditional run through the fountain outside Margie Helm Library after the last day of classes Friday, July 15. Hallmates C.J. Johnston (from left) of Leitchfield, Breanne Davis of Knoxville, Tennessee, Emily Slaven of Louisville, and Sarah Pedersen of Barbourville play cards during hall time in Northeast Hall before going to sleep Thursday, June 16. 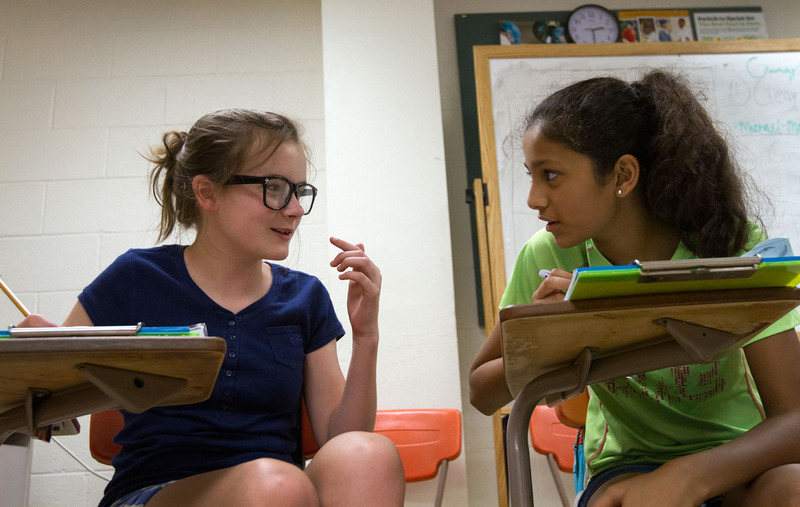 Emma McGuffey (left) and Alisha Pansuria, both from Bowling Green, discuss the stories they’re writing during Writing Boot Camp Thursday, June 16. 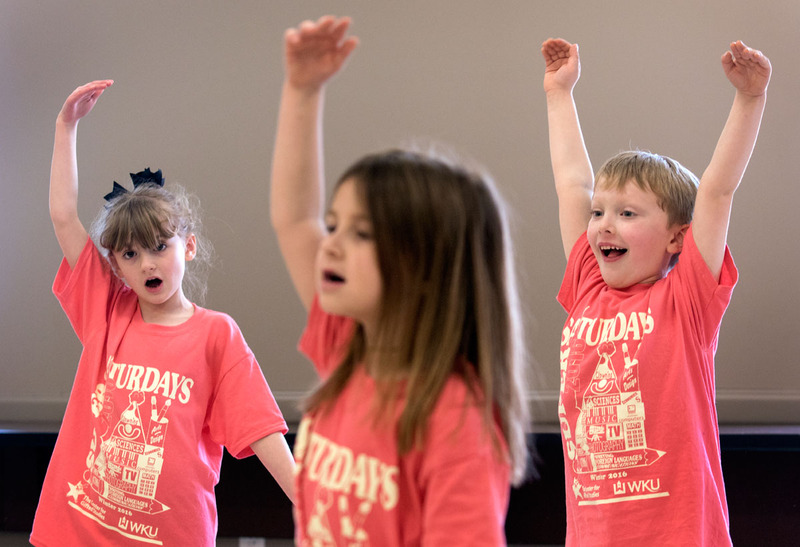 Evie Ellis (from left) of Russellville, Mary Baker of Paducah, and Anna Maddux of Pembroke rehearse a song during Singing 101 Tuesday, June 21. 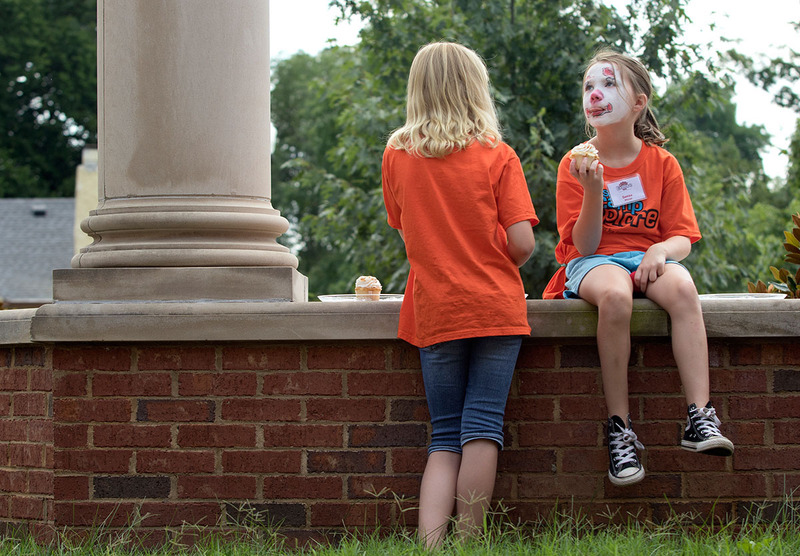 Sporting a clown face, Danika Miller eats lunch alongside a fellow camper behind Gary Ransdell Hall Friday, July 15. 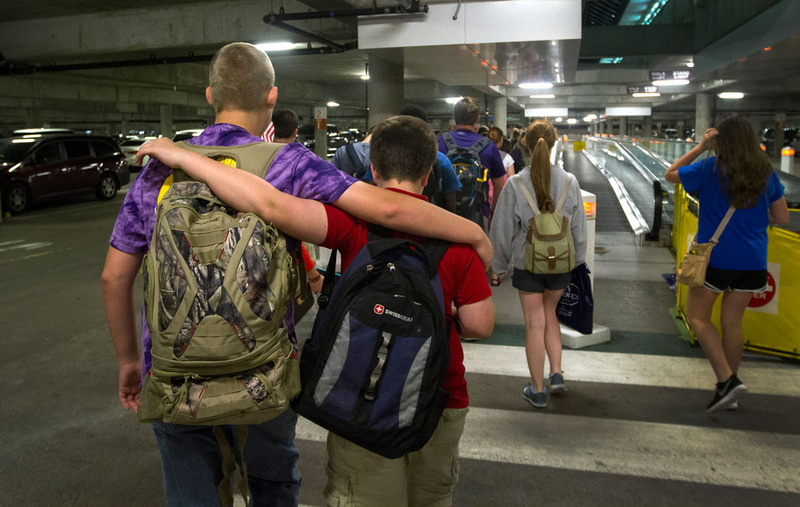 Kyra Morgan (left) of Berea and Amirta Manikandan of Cordova, Tenn., hug goodbye after packing up their belongings during checkout Saturday, July 16. 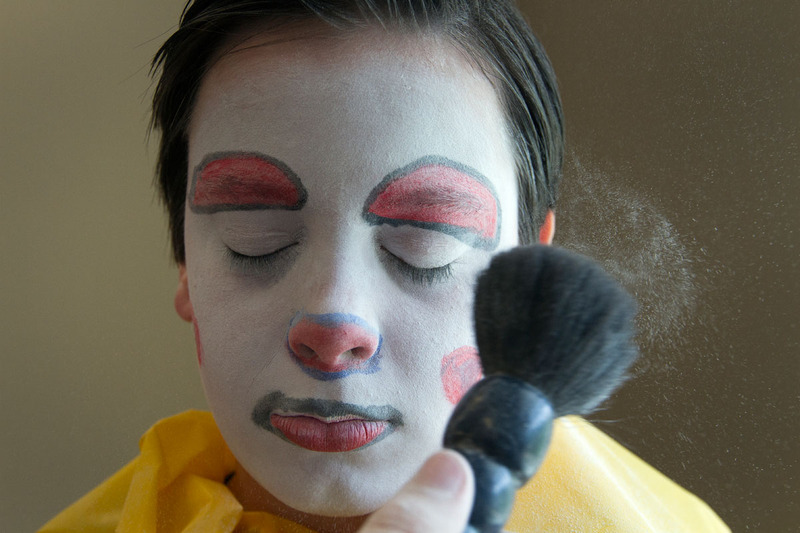 Ezekiel Salama of Shelbyville reacts after flubbing a line while rehearsing a play in Acting Monday, June 20. 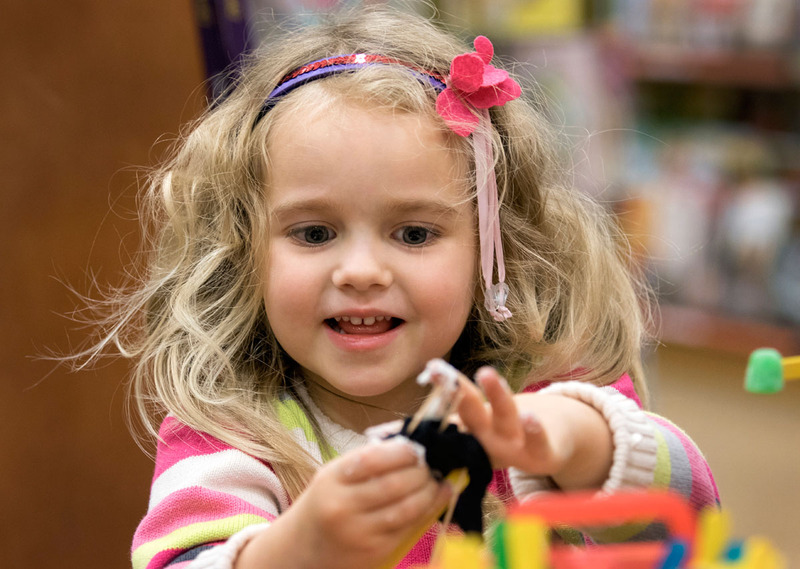 While summer is our busiest time at The Center for Gifted Studies, we have plenty going on the rest of the year too. 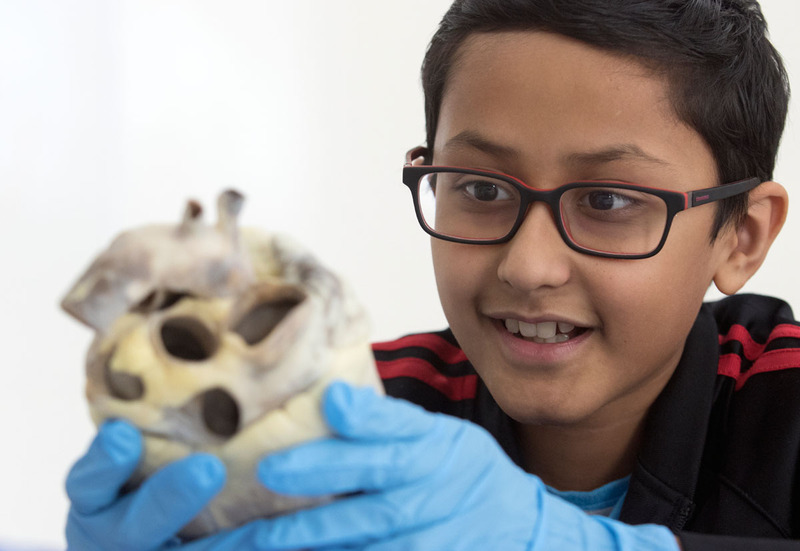 Here are a few photos of our programs taken since last summer. 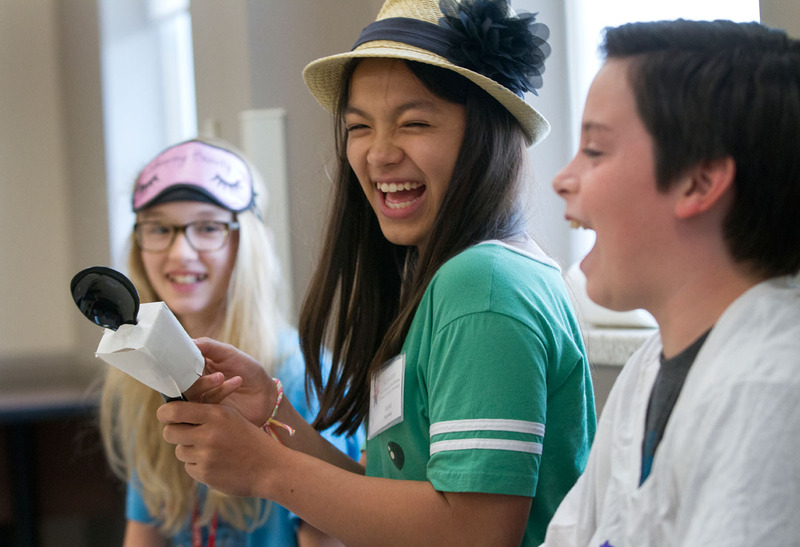 My first summer at The Center for Gifted Studies was a busy one — we had over 1,000 students and teachers came to campus for our five different programs this summer. 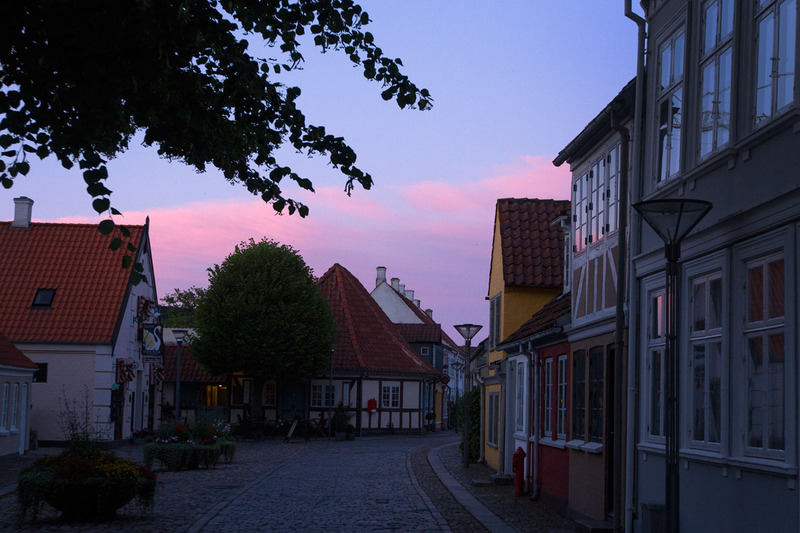 Here are some of my favorite photos from those jam-packed five weeks. 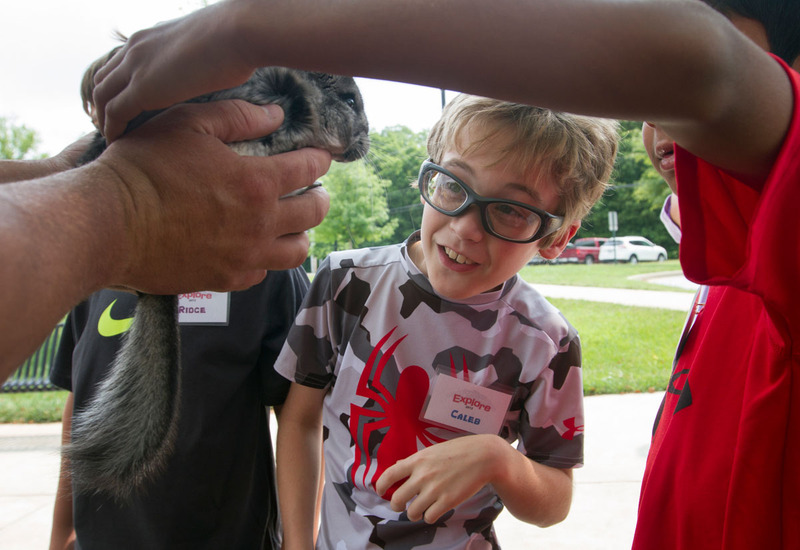 Caleb watches a chinchilla as a fellow camper pets it during a presentation from Zoodles during Camp Explore Monday, July 6. 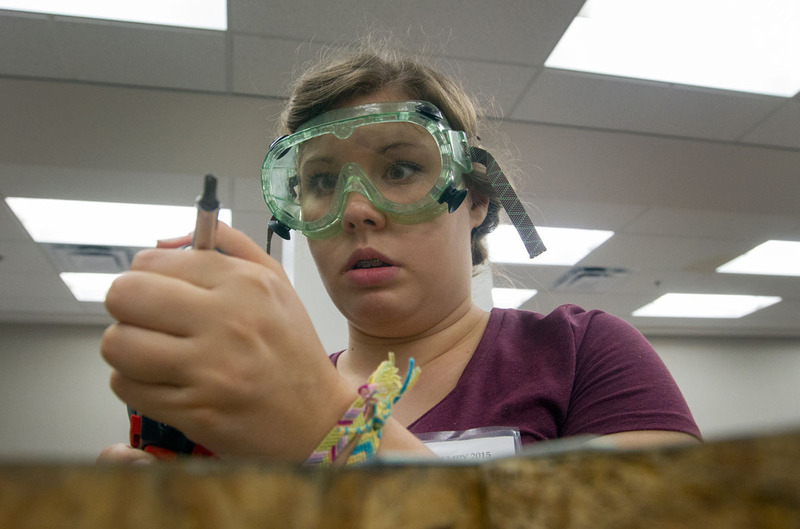 VAMPY camper Olivia Gilliam of Madisonville inspects her screwdriver before attaching two boards to be used for a Rube Goldberg machine in the STEAM Labs class July 3, 2015, in Snell Hall. The finished machine used a complicated series of tasks to complete a simple task. 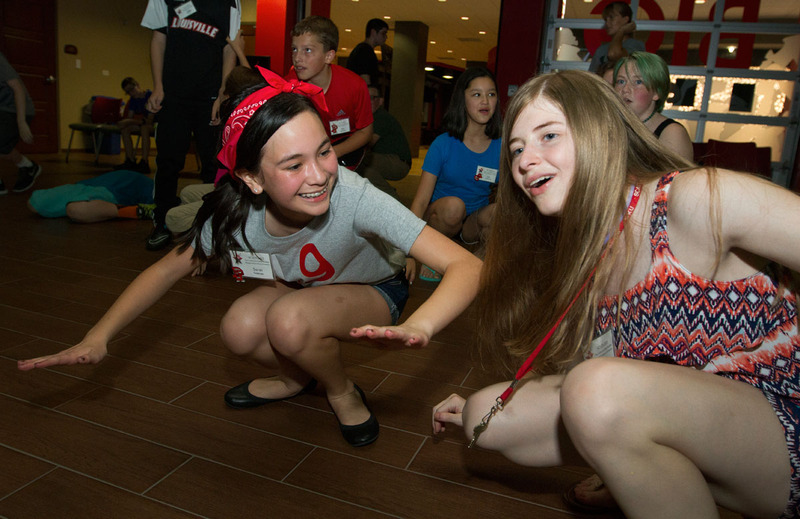 Counselors Ellie Hogg (left) and Emily Powell share a laugh Friday night in the lobby of Northeast Hall. Counselors spent the evening bonding and making door decorations. 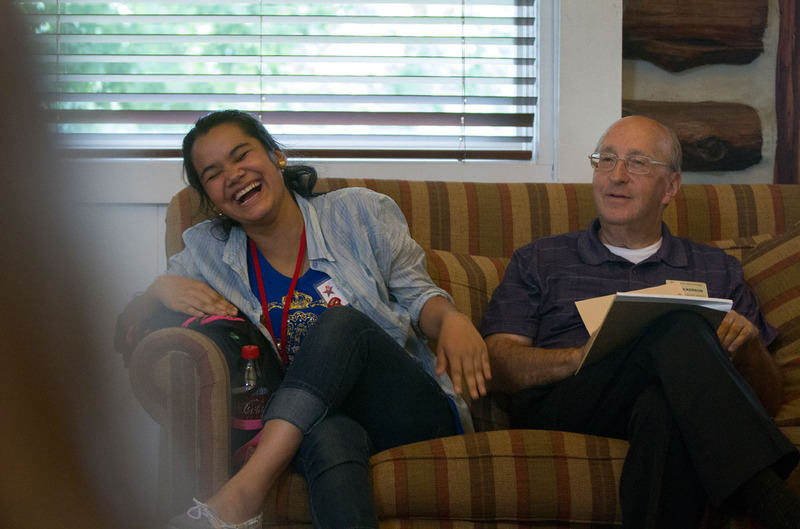 Rose Mar (left) of Bowling Green laughs while Jim Fulkerson leads his Musical Troupe class in activities to get to know each other on the first day of SCATS classes June 8 in the Faculty House. 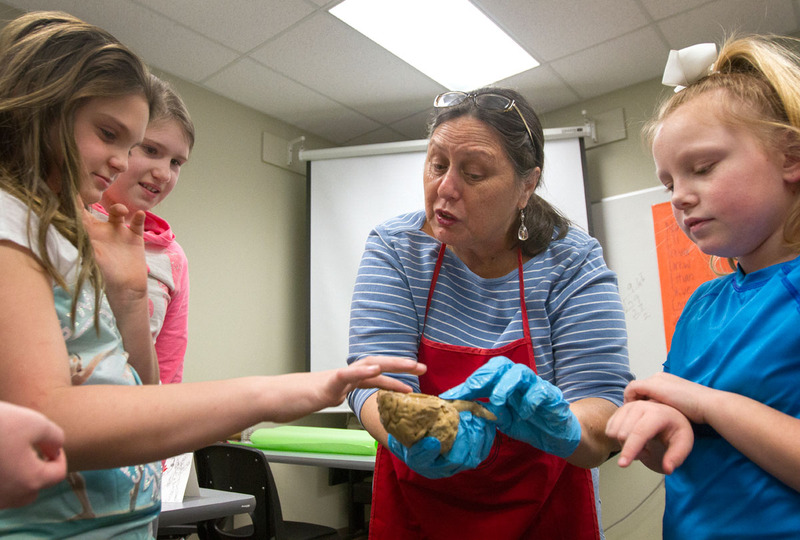 Jim has been teaching SCATS classes for 27 years. 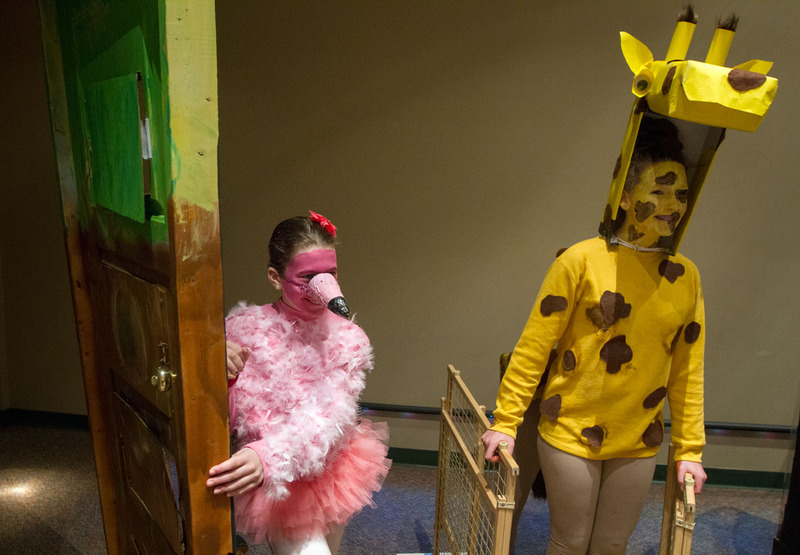 Sarah Pedersen (left) of Barbourville and Kennedy Pendleton of Hopkinsville dance during the SCATS Dance Thursday, June 18. 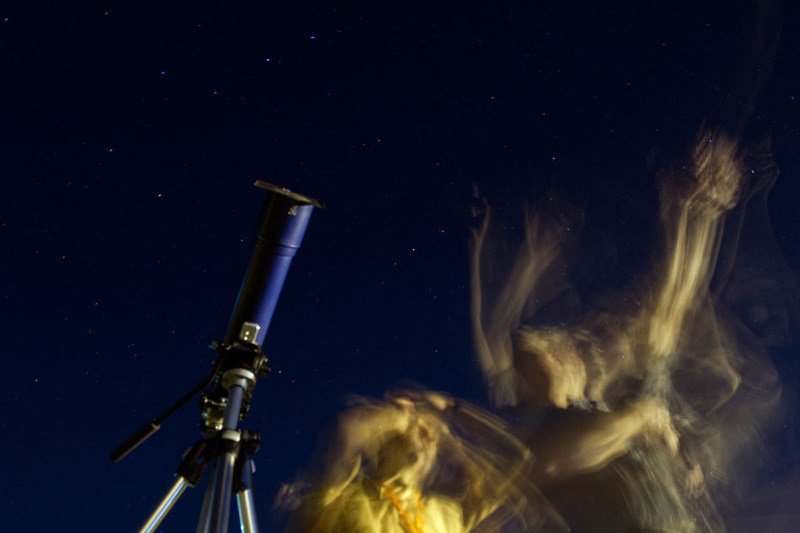 VAMPY campers look at Saturn and a variety of star formations through telescopes during a stargazing party July 6, 2015 at Western Kentucky University. 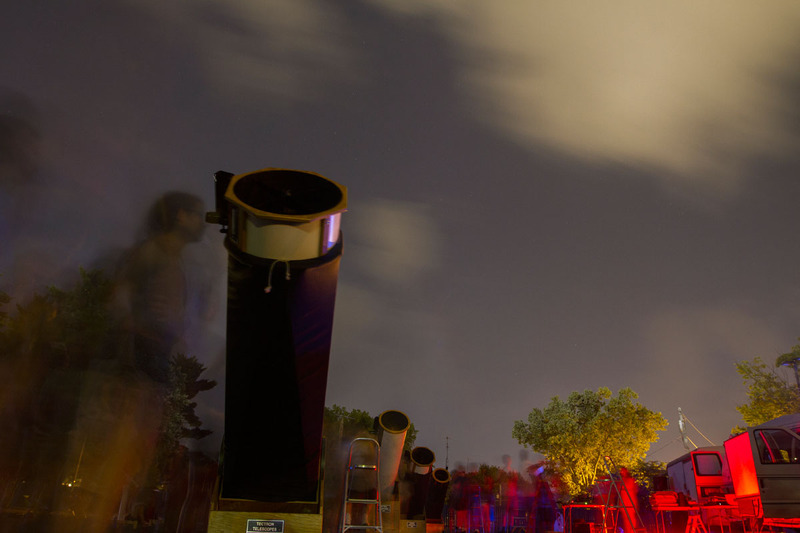 Astronomy students helped position the telescopes for other students to use. 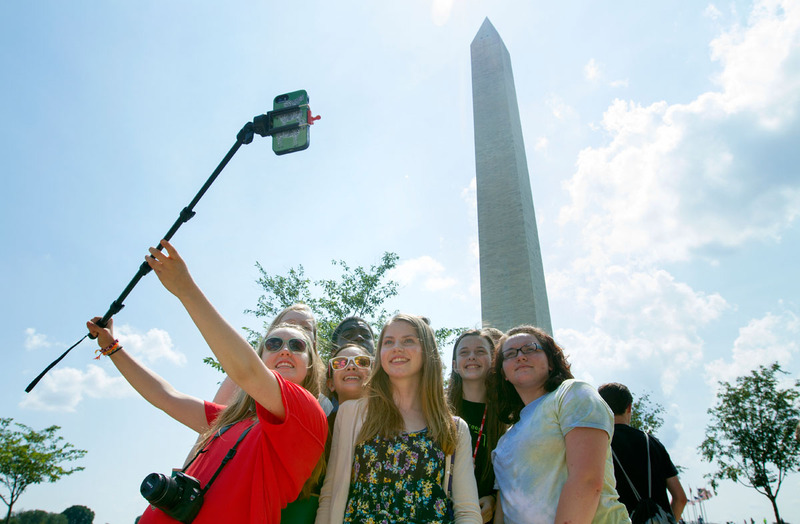 Pop Culture students take a selfie in front of the Washington Monument during a field trip to Washington D.C. Tuesday, June 30. 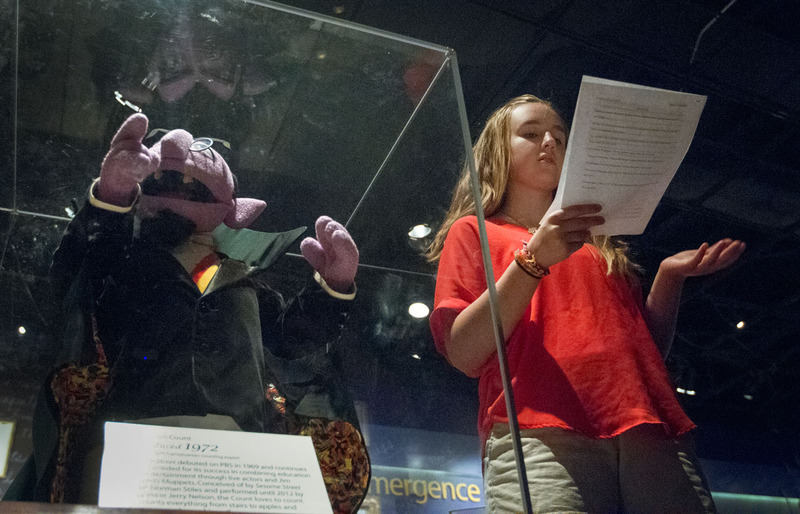 Madison Fleischaker of Louisville gives a report on Sesame Street’s Count Von Count at the National Museum of American History in Washington, D.C., Tuesday, June 30. 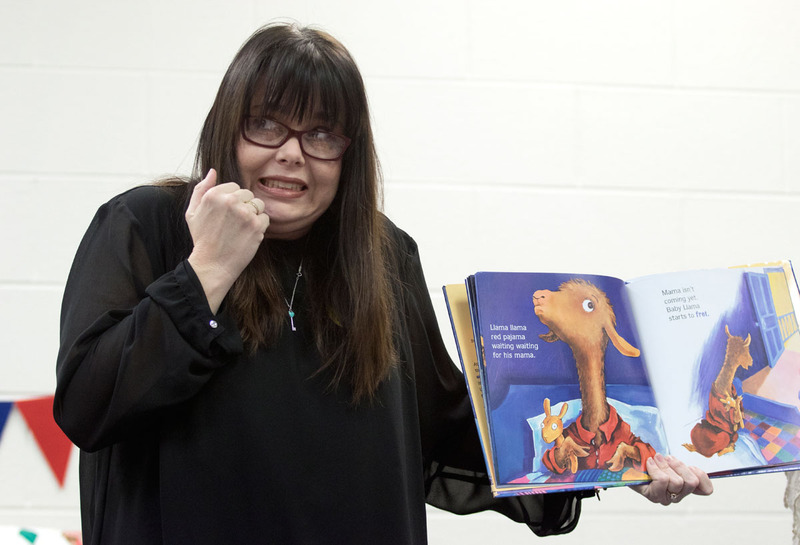 Acting teacher Julie Boggess coaches Richard Chandler of Louisville on how the Big, Bad Wolf would blow a house down while the class rehearses “Fairy Tale News” Tuesday, June 16. 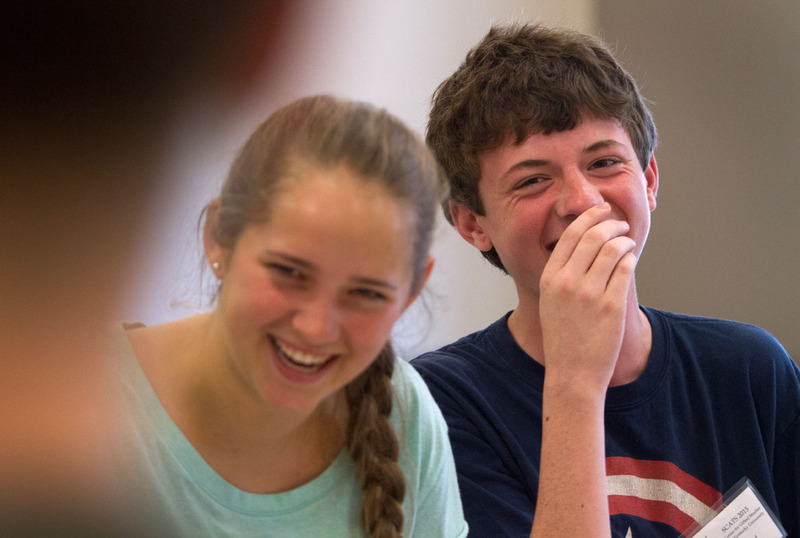 Mary Baker of Paducah and Jared Rodgers of Verona laugh after Jared flubbed a line while rehearsing for “12 Angry Pigs,” a parody of “12 Angry Men” June 11 in Acting class June 10. 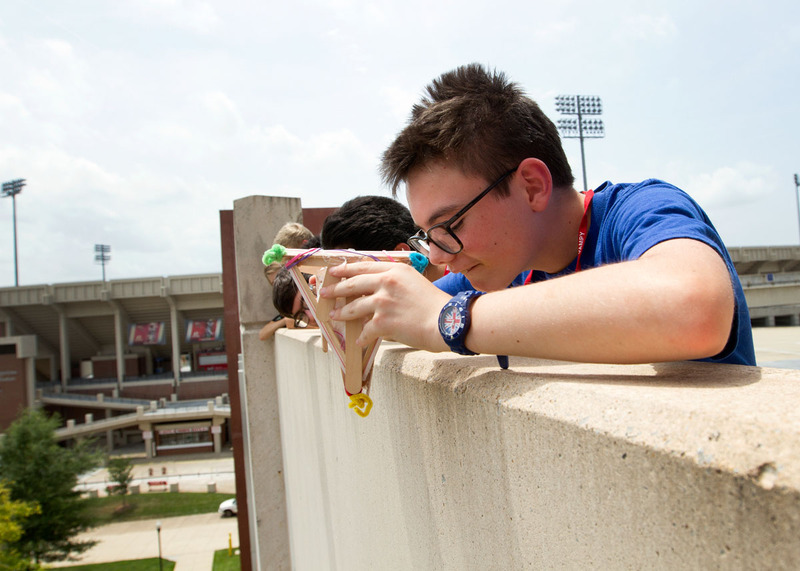 Lorenzo Mahoney of Prospect aims his egg drop container before letting it go from atop Parking Structure 2 Tuesday, June 23, during Problems You Have Never Solved Before. 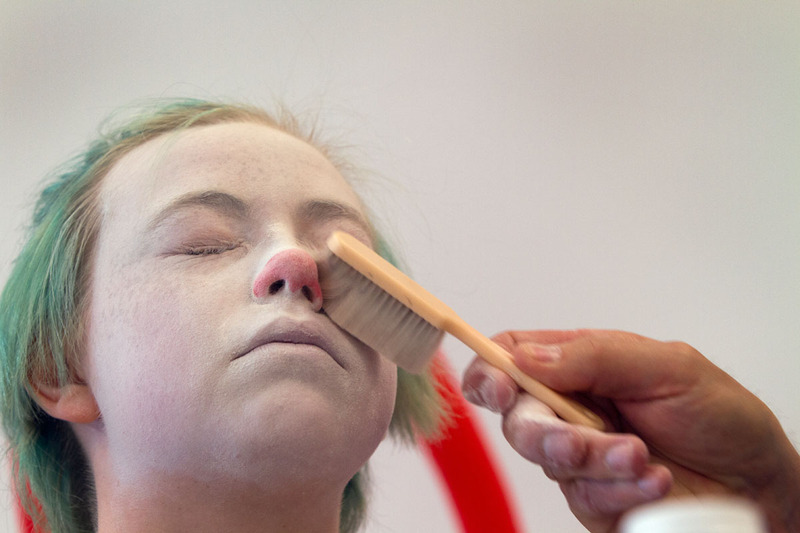 Evvie Cooley of Louisville keeps her eyes shut as her teacher, Nick Wilkins, brushes powder on her makeup during Clowning class June 10. 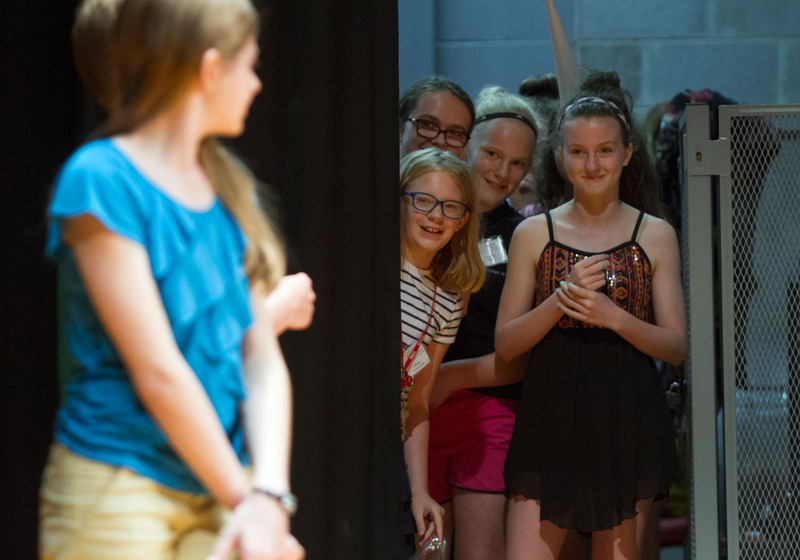 Abby Adams-Smith (from left) of Bowling Green, Chloe Paddack from Falls of Rough, Cassidy Burnside of Vallonia, Ind., and Emma North of Owensboro watch an introduction presented by the emcees before their group’s performance in the SCATS Talent Show Wednesday, June 17. Shruit Gautam of Bowling Green wait for the right moment to start singing during the Musical Troupe performance after the SCATS Banquet Thursday, June 18. 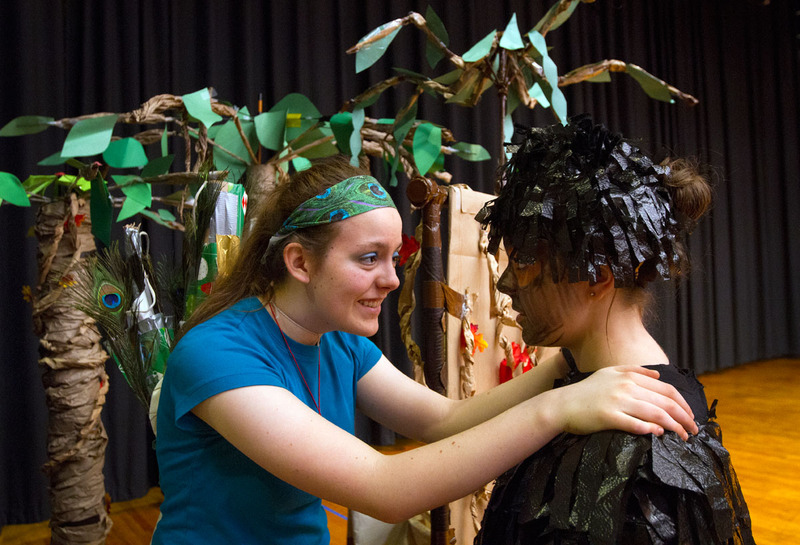 Anya Hartman of Lexington (center) laughs while rehearsing a scene in “Fairy Tale News” Tuesday, June 16 in Acting. 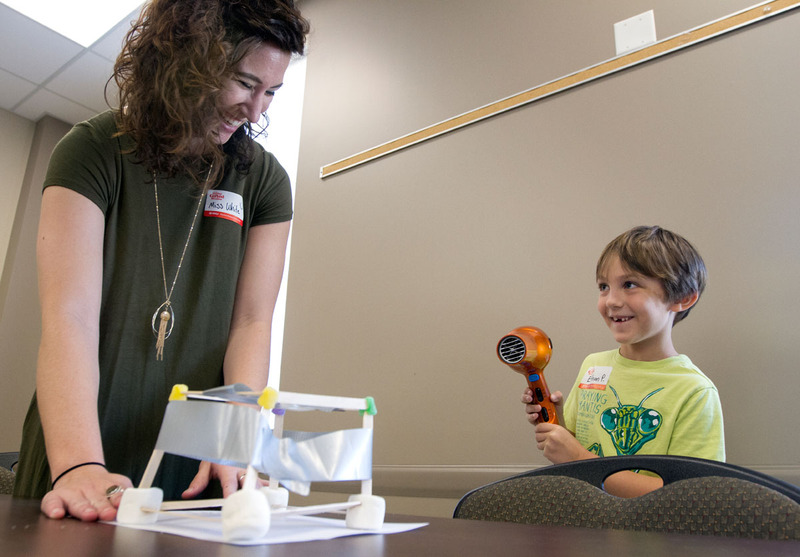 Anya is attending SCATS for the second year, and her mother is an alumnus of The Center for Gifted Studies’ summer programming as well. 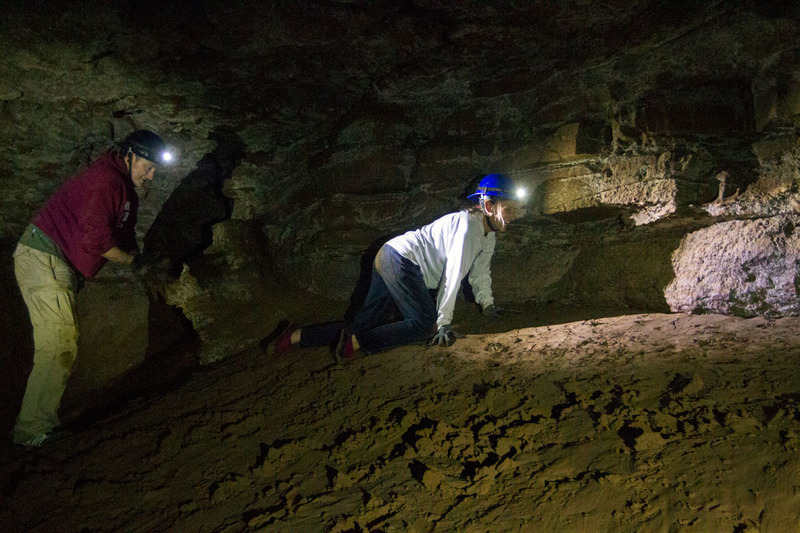 Advanced Placement Environmental Science teachers explore Hidden River Cave in Horse Cave, Ky., June 25 as part of the Advanced Placement Summer Institute. 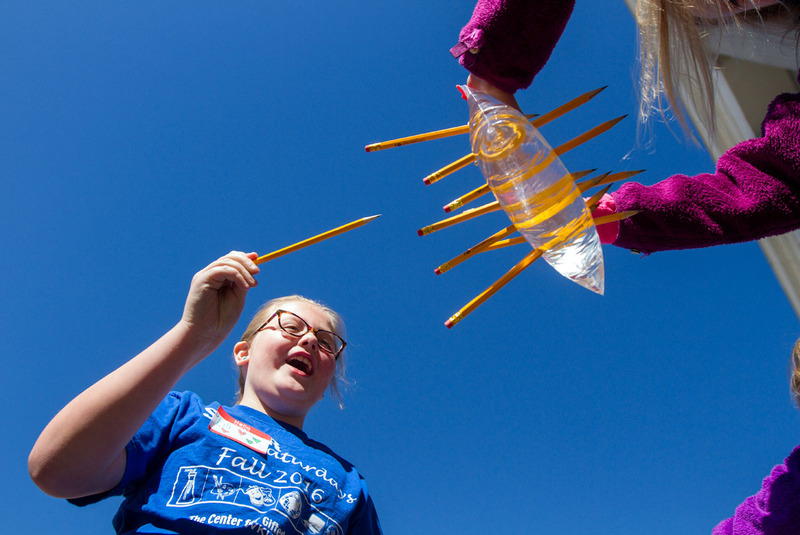 Here are some of my favorite photos that I shot for the Catholic Courier this fall. Thanks for looking! Aquinas sophomore Lauren Begy (19) prepares to head the ball during the second half of the Section V Class B championship Oct. 31 at Caledonia-Mumford Central School in Caledonia. 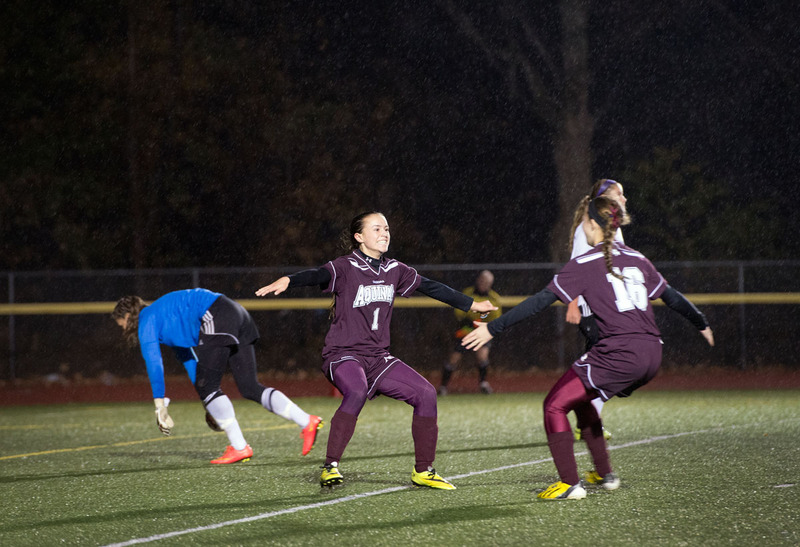 After four overtime periods, Aquinas won a penalty-kick shootout to advance to State. Aquinas freshman Alana Piano (1) runs to hug sophomore Lindsey Brinkel (16) after scoring in the first half of the Section V Class B championship Oct. 31 at Caledonia-Mumford Central School in Caledonia. 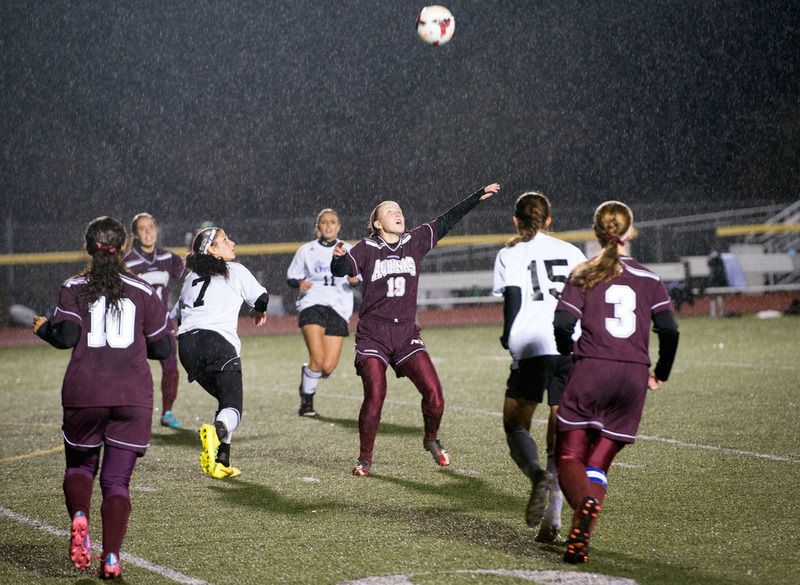 After four overtime periods, Aquinas won a penalty-kick shootout to advance to State. 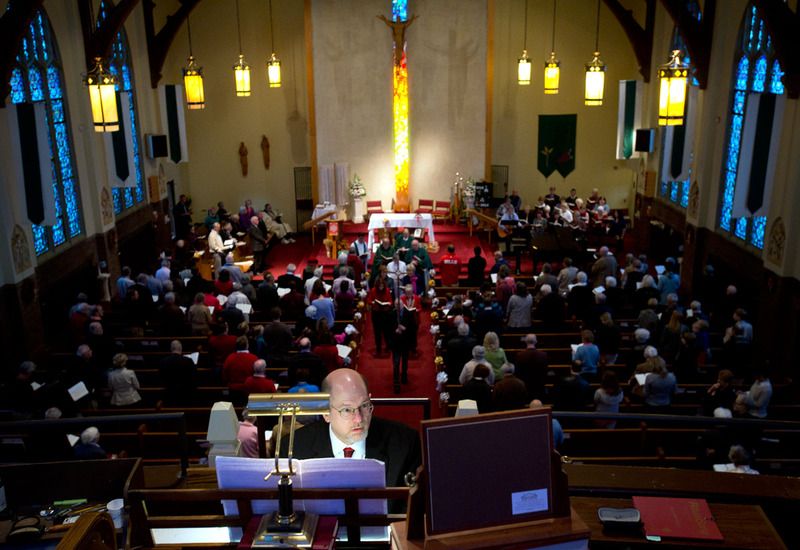 Organist Terrance Keach glances at his mirror to check the progress of the recession while playing the final song during a Mass held to celebrate the 100th anniversary of St. John the Evangelist Church in Rochester Oct. 5. 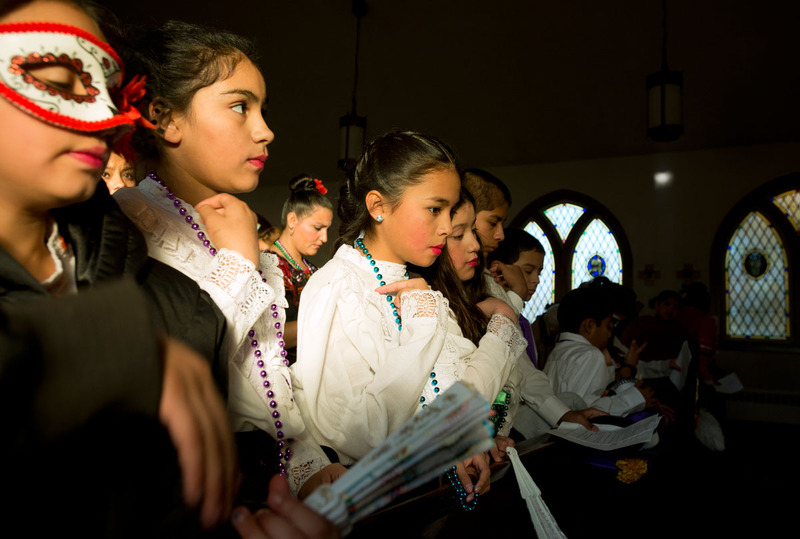 Ten-year-old Andrea Hurtado (center) and other children make the sign of the cross at the end of Mass celebrating Day of the Dead Nov. 2 at Church of the Epiphany in Sodus. The children were dressed in ceremonial costumes to participate in dances during a celebration afterward. 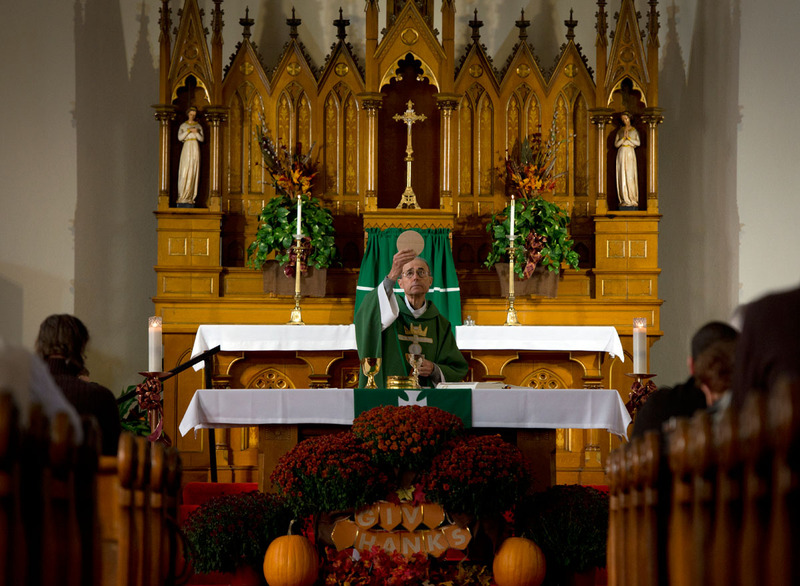 Father Roy Kiggins celebrates Communion during Mass at St. Mary Church in Waterloo Oct. 12. 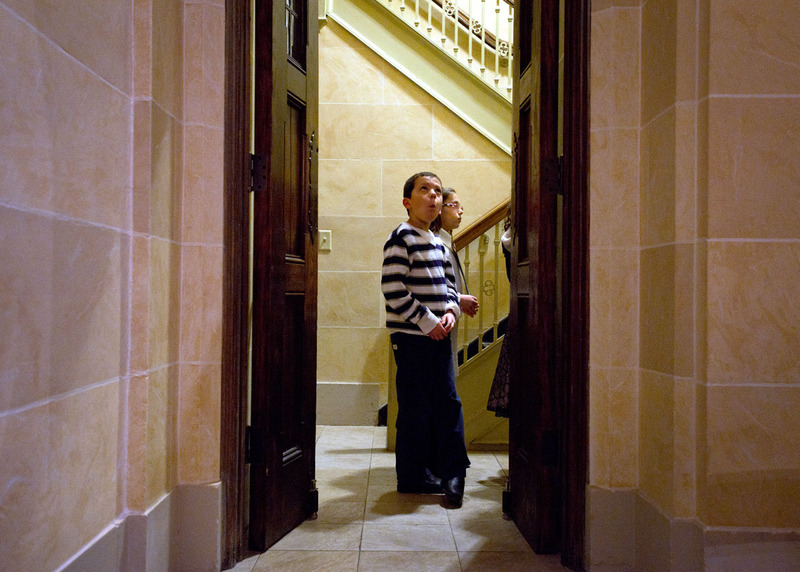 Nine-year-old Robbie Schultz looks out at the sanctuary in Rochester’s Sacred Heart Cathedral before processing in with fellow members of the children’s choir from Fairport’s Church of the Assumption before an awards ceremony held by the Rochester Chapter of the National Association of Pastoral Musicians Nov. 21. 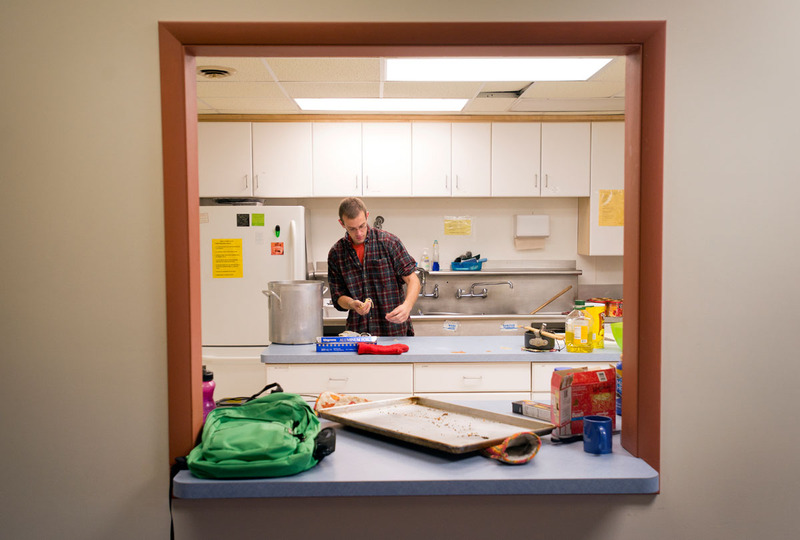 Senior Tom Brett scoops spaghetti noodles off the counter after cooking dinner for the SUNY Geneseo Newman Community Sept. 18 at the school’s Interfaith Center. 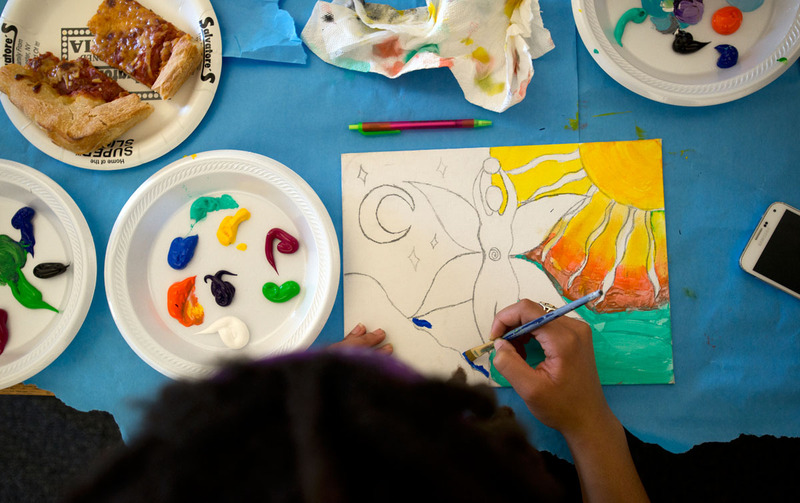 A Franklin High School student works on a painting during an Oct. 9 workshop held over lunch with Roberto Mamani Mamani, a guest artist visiting from Bolivia. 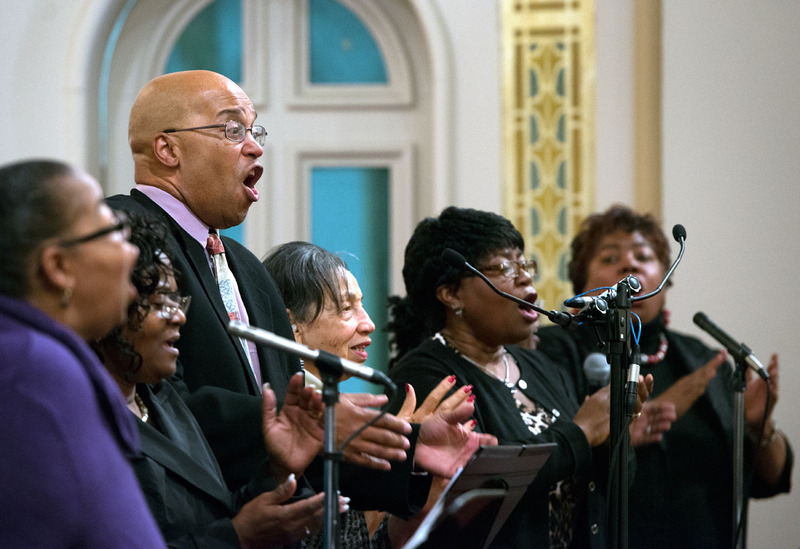 Choir members sing the opening hymn, “I’m Sanctified,” during the second night of the Black Catholic Revival Nov. 14, hosted by the Diocese of Rochester at Rochester’s Immaculate Conception/St. 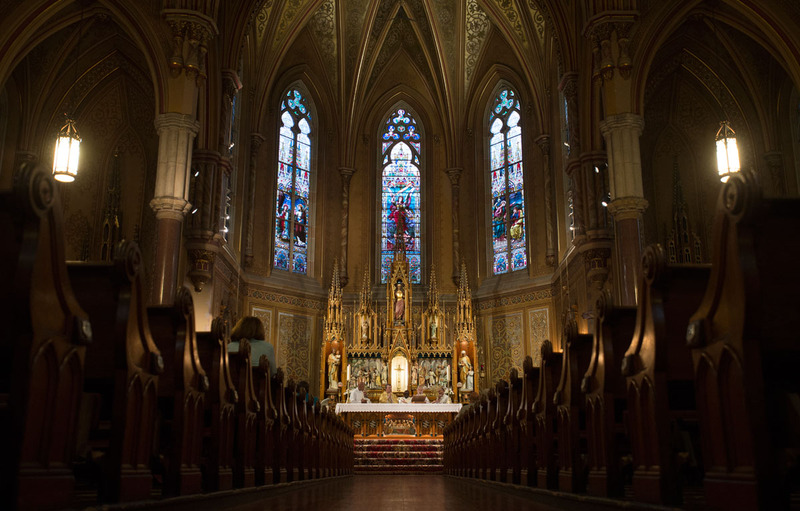 Bridget’s Church. 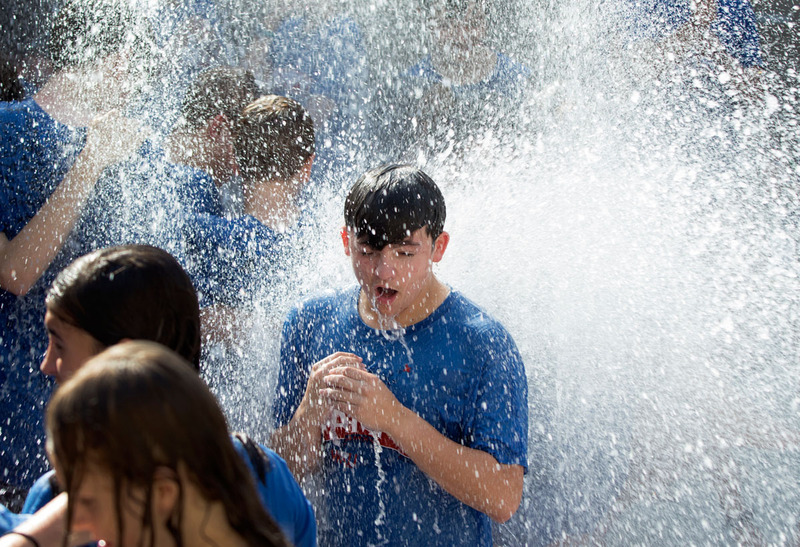 Here are my favorite pictures from assignments I covered in August for the Catholic Courier. Sister Ritamae Dillon hugs Margaret Amisano during a luncheon to celebrate the 70th anniversary of the Dominican Monastery of Mary the Queen in Elmira Aug. 16. The 15 religious sisters living in the monastery moved to Illinois Sept. 2. 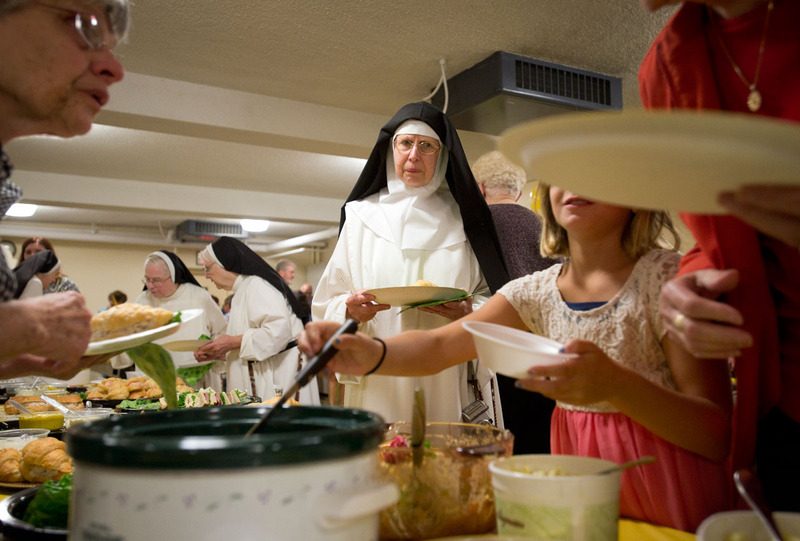 Cloistered Dominican nuns mingle with guests during a luncheon to celebrate the 70th anniversary of the Dominican Monastery of Mary the Queen in Elmira Aug. 16. 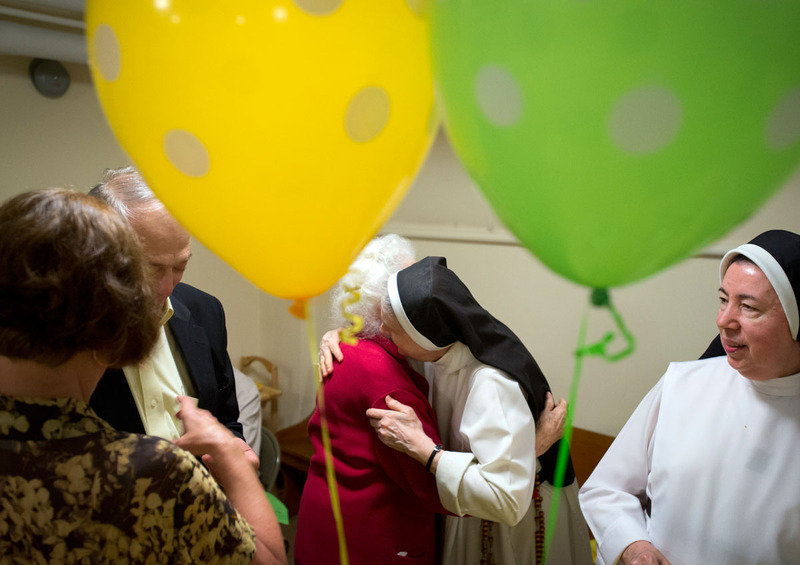 The 15 religious sisters living in the monastery moved to Illinois Sept. 2. 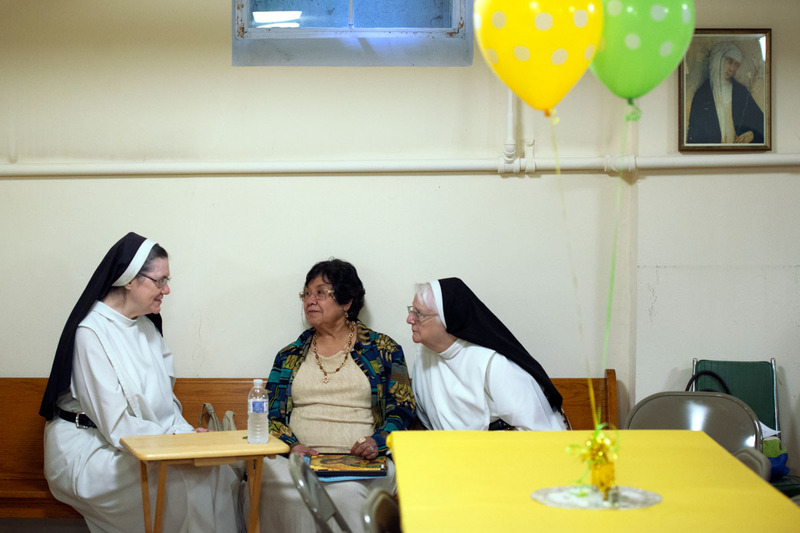 Sister Mary of Jesus (from left) visits with Gloria Messemer and Sister Marie Grace during a luncheon to celebrate the 70th anniversary of the Dominican Monastery of Mary the Queen in Elmira Aug. 16. Messemer and Grace were both visiting from the Bronx. 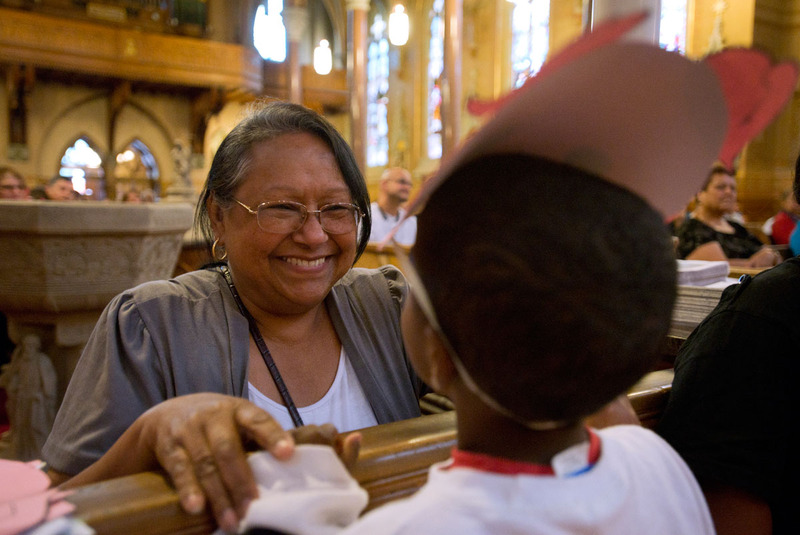 Sister Mary of Jesus and several other sisters moved from the Bronx to Elmira seven years ago. Eleven-year-old Noah Mitchell, a sixth grader at School Number 4, has his hair cut by John William at Monroe High School’s back to school event Aug. 27. 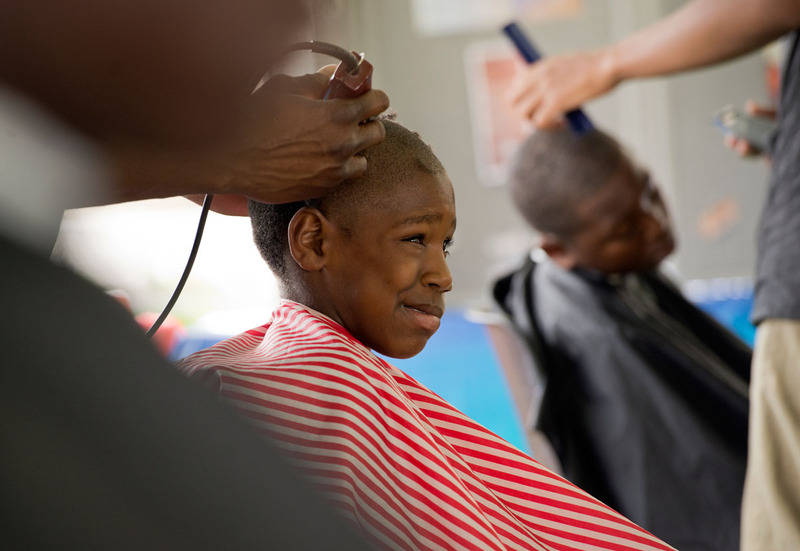 William and other students from the Sharp Edgez Barber Institute provided free haircuts to students. 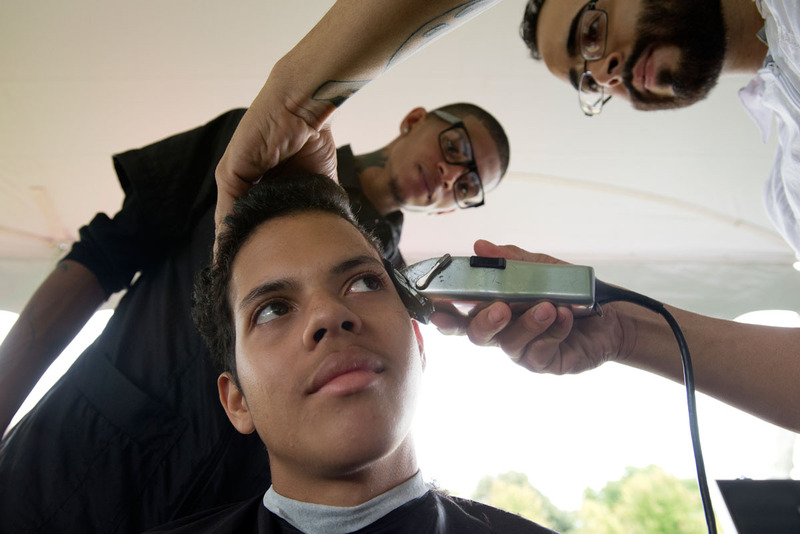 Seventh grader Elmer Zayas has his hair cut by Michael DeJesus, an instructor at Sharp Edgez Barber Institute, while student Dennis Martinez watches during a back to school event at Monroe High School Aug. 27. 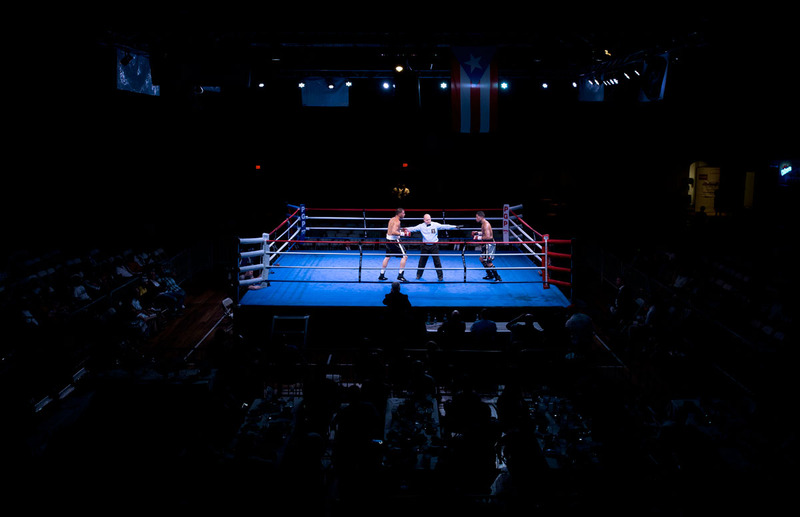 A New York State Athletic Commission official separates two boxers during the Throwdown at the Armory II put on by Pretty Girl Productions Aug. 23 at the Main Street Armory in Rochester. 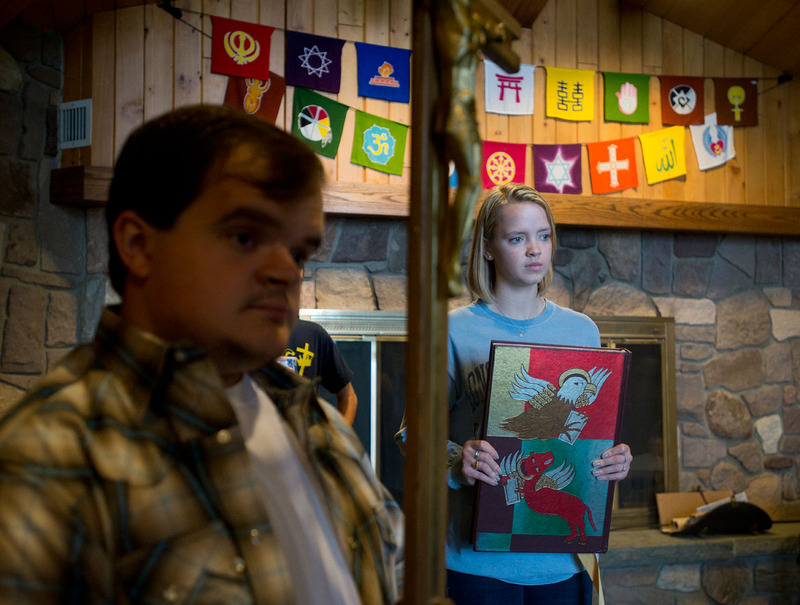 Huntington, Md., junior Nathan Rafalowski, left, and Denville, N.J., sophomore Allie Krummann wait to process into Mass at Muller Chapel on the campus of Ithaca College Aug. 31 in Ithaca, N.Y. The interfaith chapel is home to Catholic, Jewish and protestant student groups. 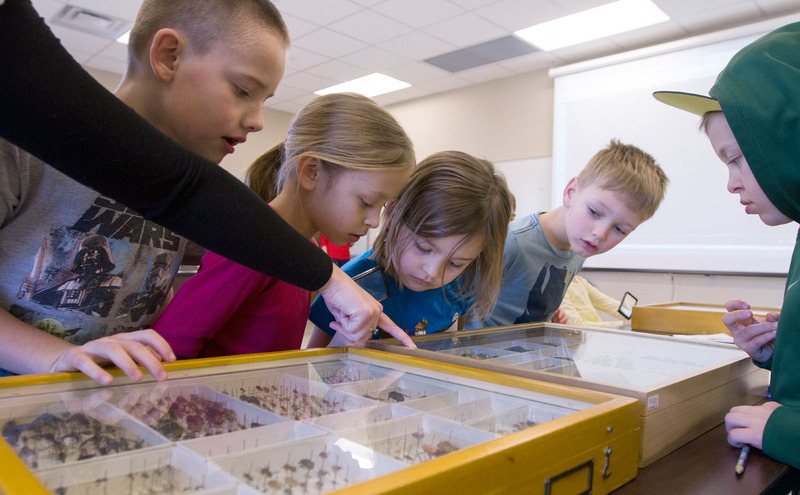 Fall semester classes at the university began Aug. 27. Jesuit father Carsten Martensen serves Communion during a Mass in Muller Chapel on the campus of Ithaca College Aug. 31 in Ithaca, N.Y. 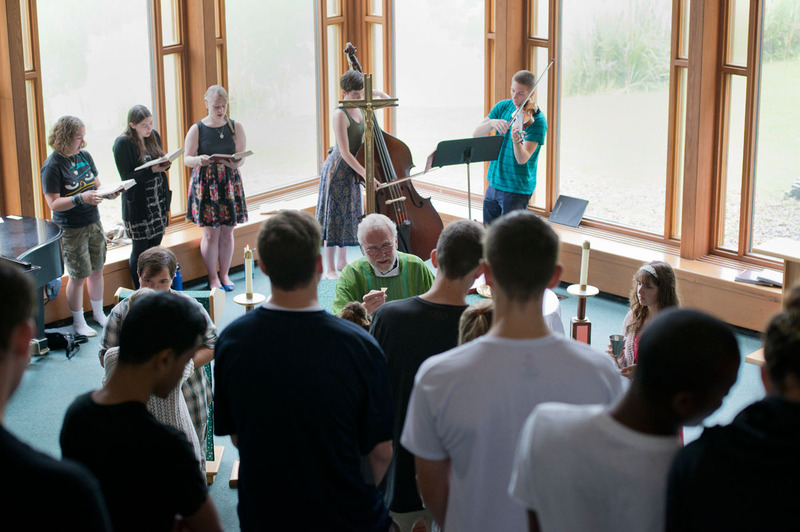 The interfaith chapel is home to Catholic, Jewish and protestant student groups. Fall semester classes at the university began Aug. 27. 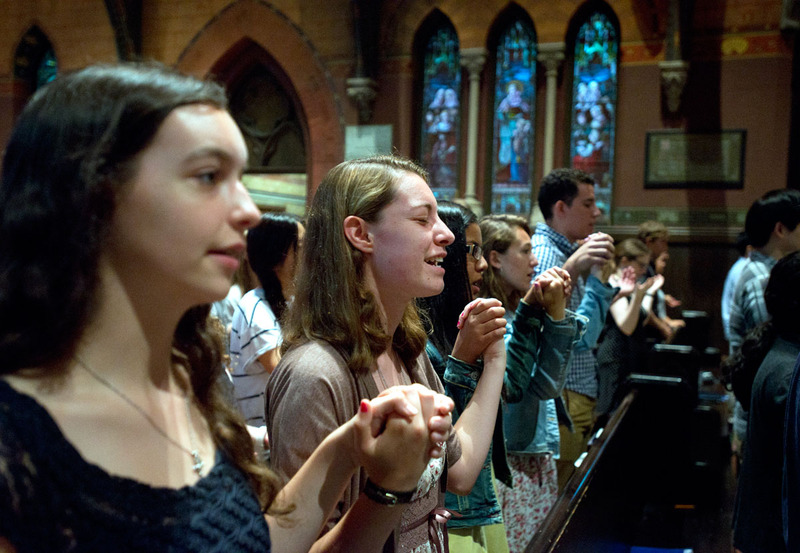 Melbourne, Fla., freshman Meriel Engrand, left, and Greenville, Ohio, freshman Grace Winhoven hold hands while praying the Our Father during Mass in Sage Chapel on the campus of Cornell University Aug. 31 in Ithaca, N.Y. 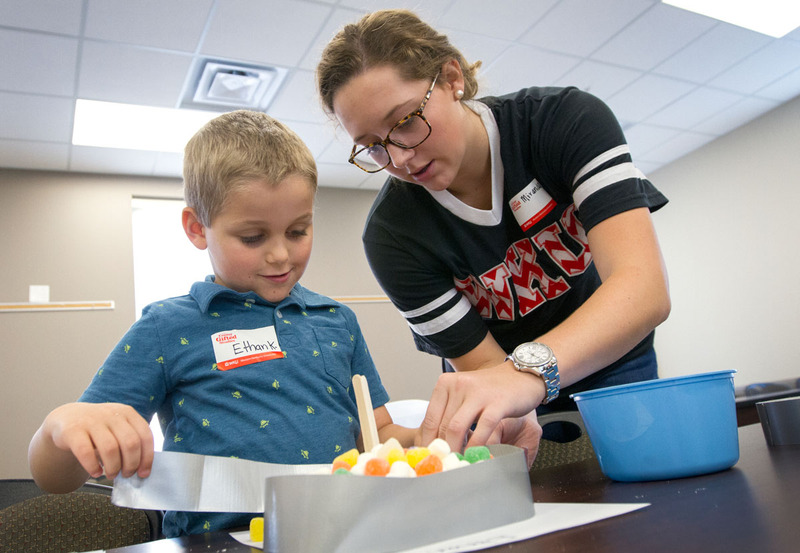 The Cornell Catholic Community planned a variety of events to welcome students back to campus after fall semester classes began Aug. 26. Tom Malthaner (from left), Sister Grace Miller, Heide Parreño and Harry Murray pray the rosary while spending the night in the Civic Center Garage in Rochester after being asked to leave by garage employees Aug. 20. 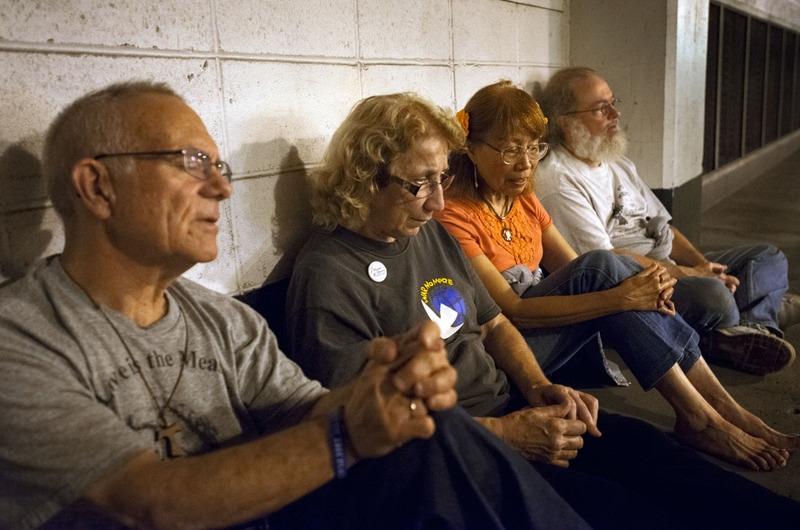 Eight people staged a sit-in to protest the closing of the Civic Center Garage to homeless people who had been spending nights inside the parking structure. 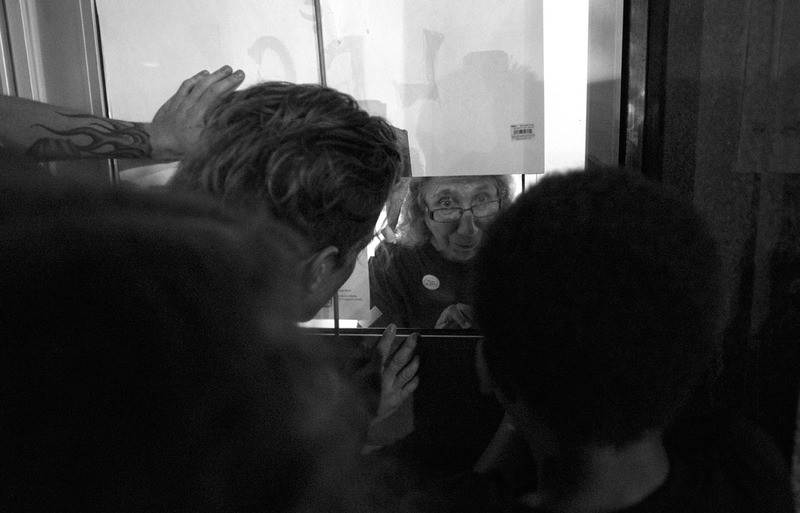 Sister of Mercy Grace Miller, executive director of the House of Mercy, speaks to supporters through a door to the Civic Center Garage in Rochester Aug. 20. Miller and seven other advocates for the homeless staged a sit-in to protest the closing of the garage to homeless people who had spent nights there. Around 20 additional advocates protested outside the garage. 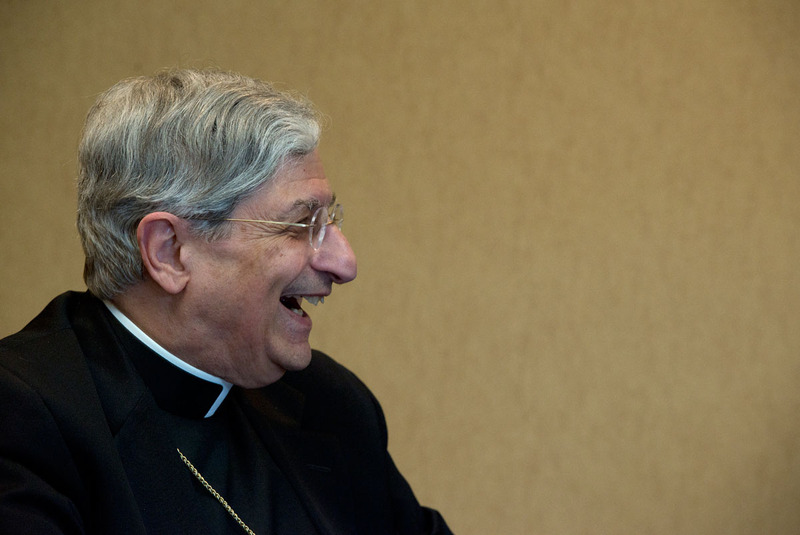 Bishop Salvatore R. Matano laughs while visiting with deacons and other diocesan employees after being presented with a gift on behalf of the diocese’s permanent deacons Aug. 5 at the Diocesan Pastoral Center. Arelis Medero helps 5-year-old Hector DeJesus change from a cow mask into a pig mask during a skit on the fourth night of Santa Misión at St. Michael Church Aug. 14. Father Jesus Flores hears a confession from Gloria Rivera during the fourth night of Santa Misión at St. Michael Church Aug. 14. 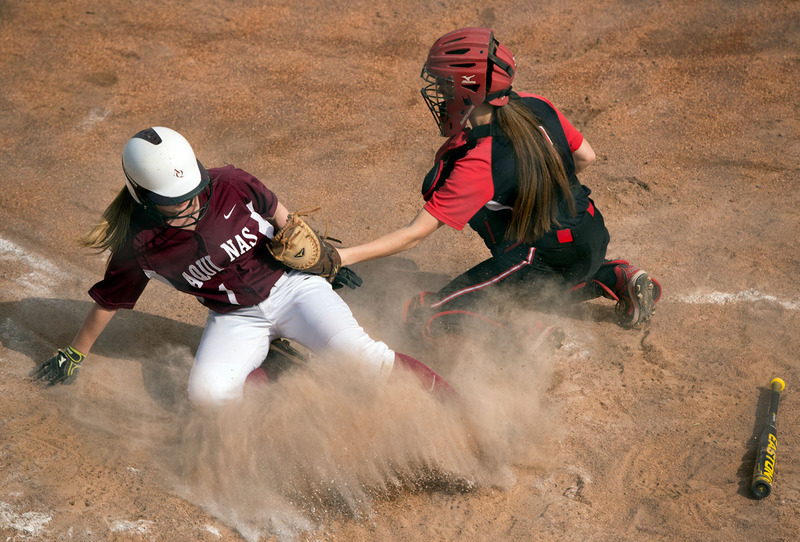 Megan Hildebrand slides safely into home plate to score in the fifth inning of Aquinas Institute’s 5-3 loss to Geneva May 29 in the Section Five Class A2 championship game at the State University of New York at Brockport. 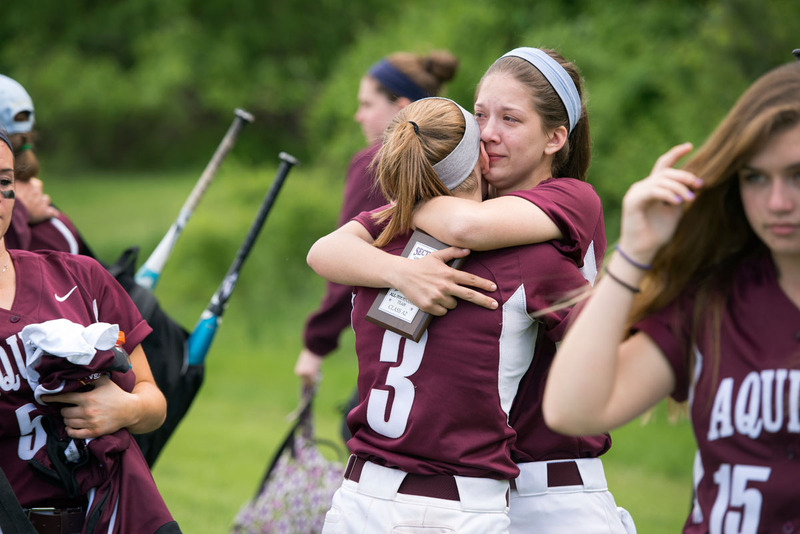 Sam Ashman hugs Sarah Gensler (3) after Aquinas’ 5-3 loss in the Section Five Class A2 championship game. Ashman was named to the all-tournament team. 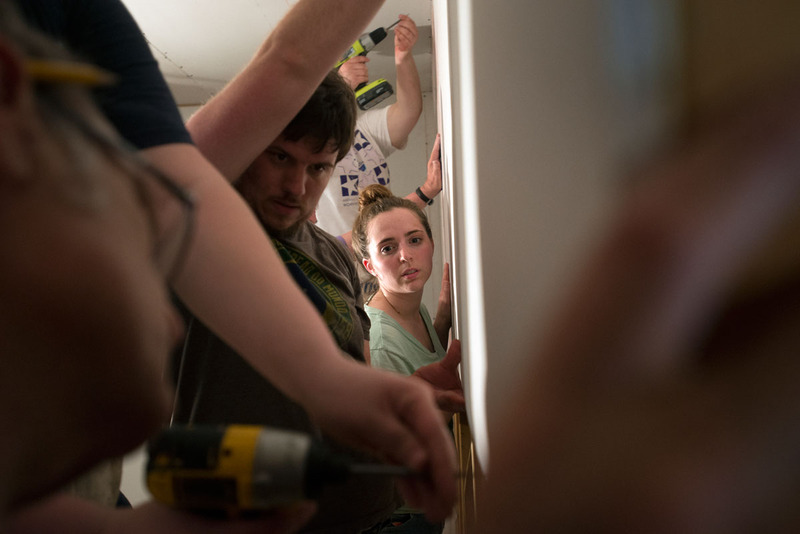 James Pike and Alice Swarthout hold up a piece of Sheetrock while other volunteers attach it to a bedroom wall at a home in Genoa, W.Va. Eighteen volunteers from the Gates Catholic Community traveled to the Appalachians on a mission trip at the end of May. 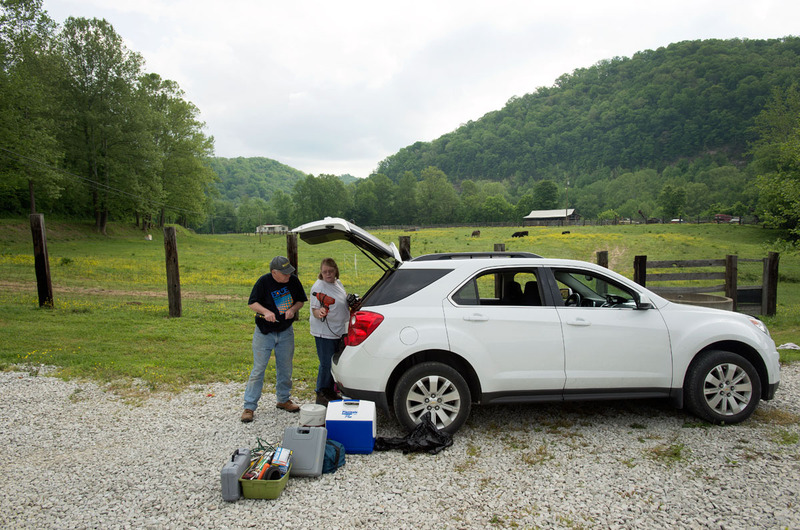 Jim and Leah unload tools before working on a home in eastern Kentucky. 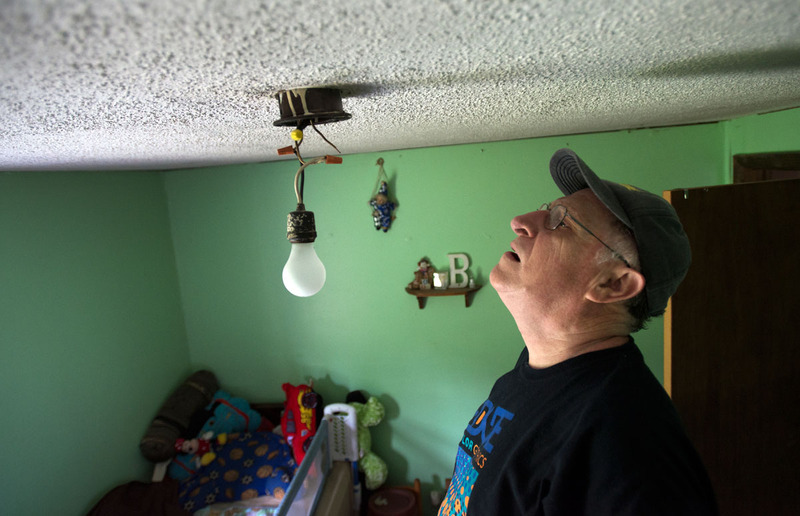 Jim Stocks inspects the wiring of a ceiling light in a bedroom at a home in eastern Kentucky. The light could only be turned on when the home’s kitchen light was also on. 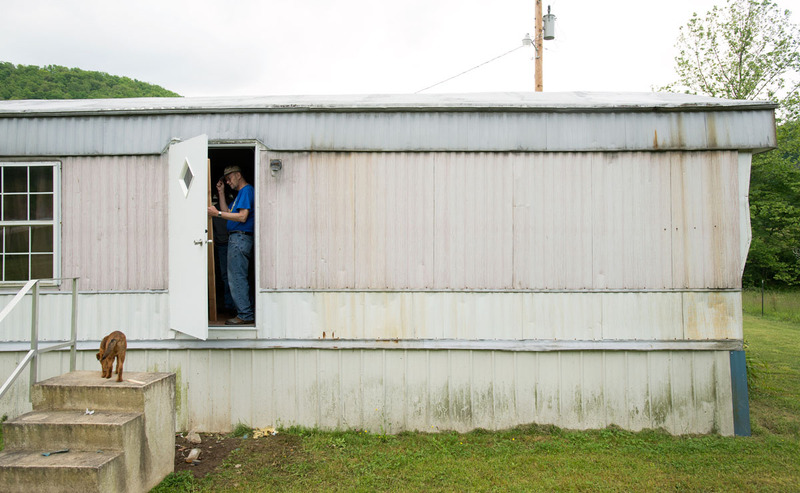 Dale measures wood for a door frame at a home in eastern Kentucky. 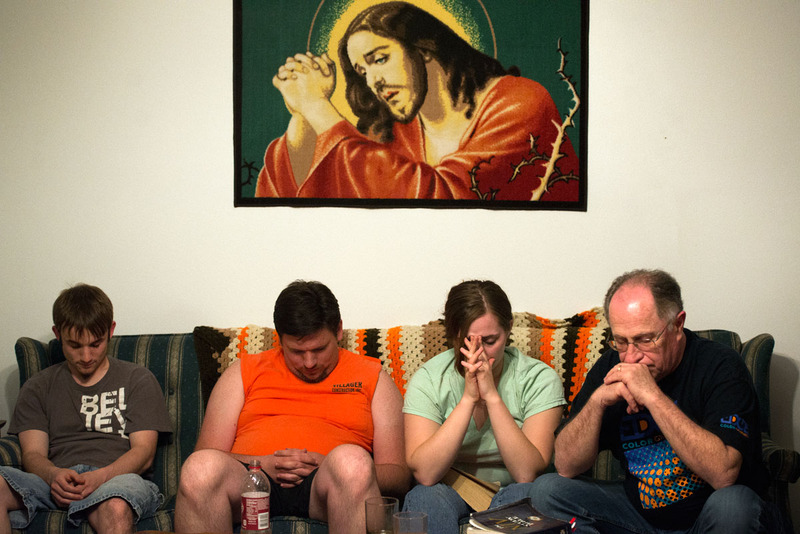 Jonathan Willistein (from left), James Pike, Alice Swarthout and Jim Stocks pray at the end of a Bible study May 20 at the house they stayed at in Louisa, Ky.
A student listens to a lesson during Hillside’s Youth Employment Training Academy May 31. 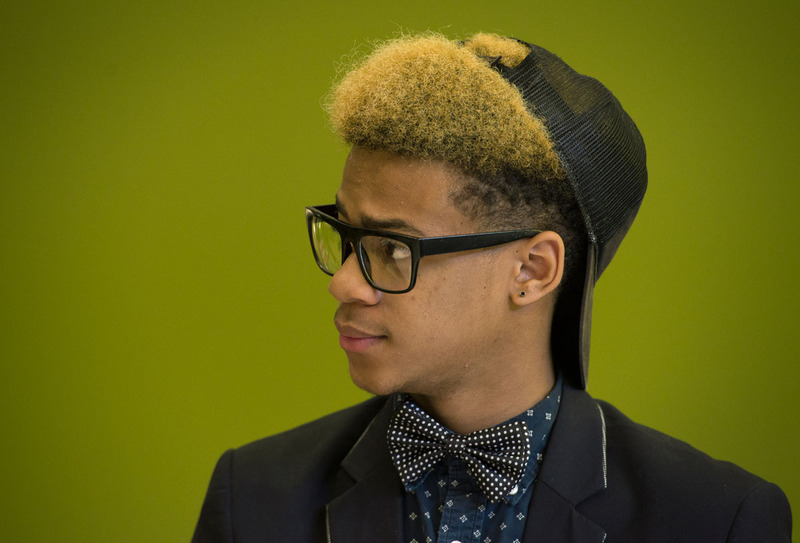 The 5-day, 25-hour training helps teenagers prepare to apply for jobs at partner companies. 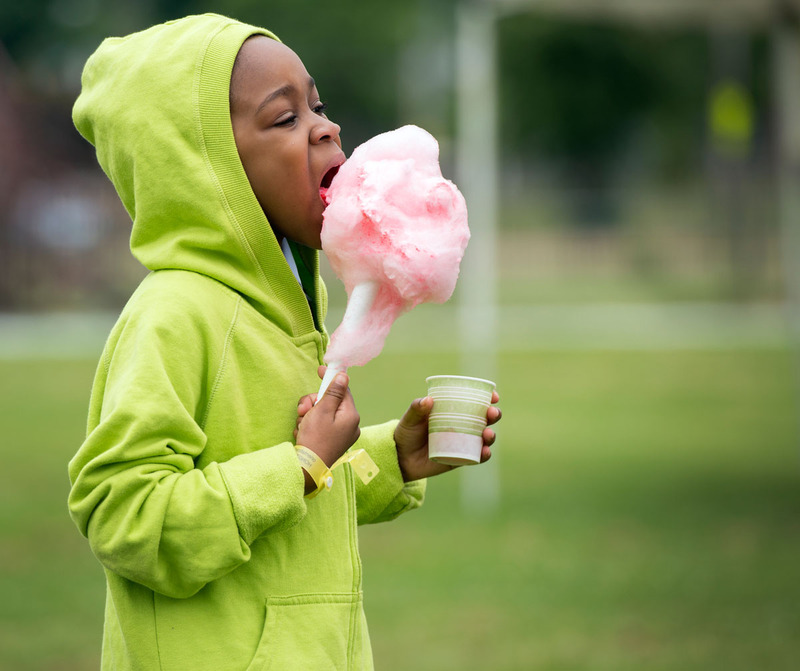 Seven-year-old Sesly Williams eats cotton candy during the Rochester City School District Latino Family Fair at Rochester International Academy June 14. A variety of carnival-themed foods were given out at the fair. 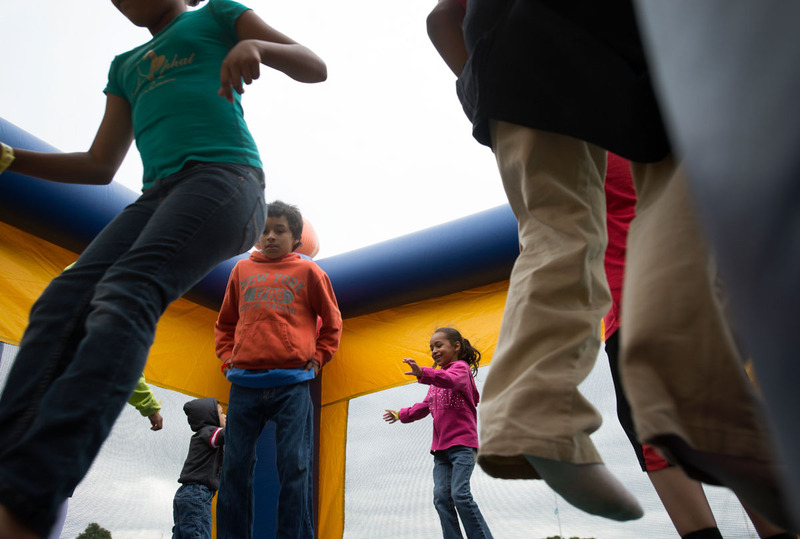 Nine-year-old Lyan Ortiz (from left), 8-year-old Reinaldo Sepulveda and 5-year-old Rihanna Sepulveda jump in a bounce house during the Rochester City School District Latino Family Fair June 14 at Rochester International Academy. 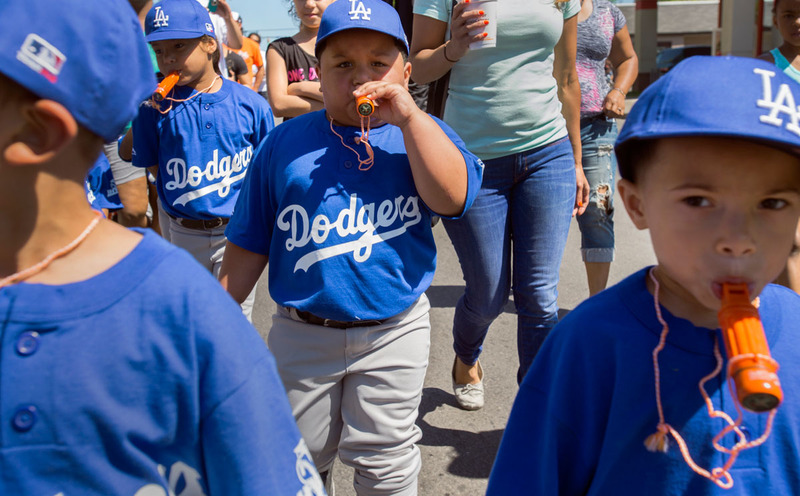 Five-year-old Luis Manuel Ramos blows a whistle while walking with teammates in a parade down Clinton Avenue to kick off the Rochester Hispanic Youth Baseball League’s 19th season June 7. Nine-year-olds Edy Marlin (left) and Julier Ruiz high-five Spikes, the Rochester Red Wings mascot, at the end of the parade down Clinton Avenue. 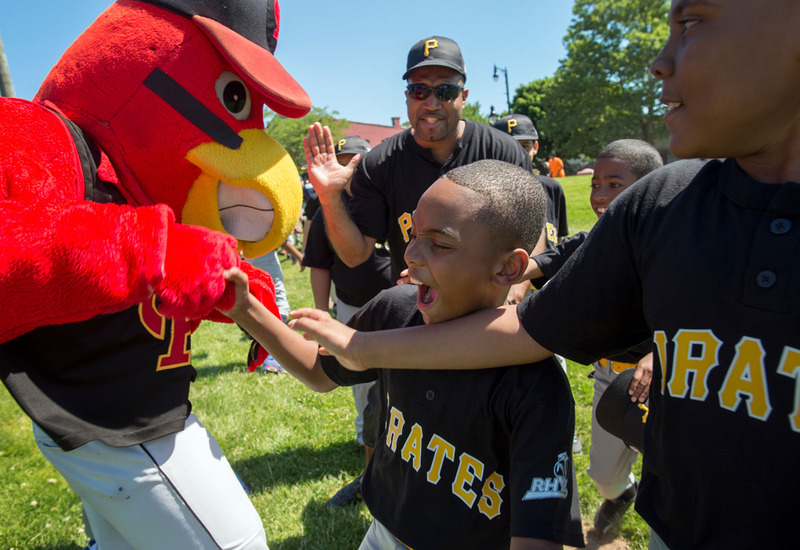 Ten-year-old pitcher John Rios fields a ball as a Pirates player scores a run. 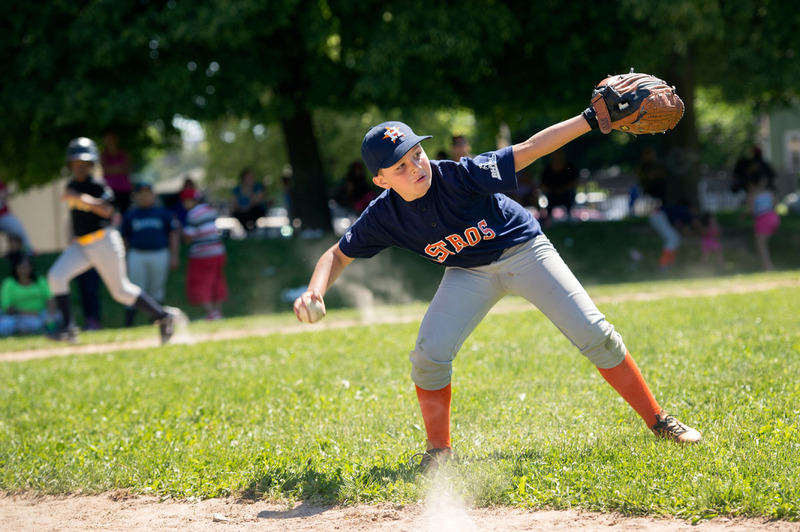 The Astros beat the Pirates 12-8 in RHYBL’s first game of the season. 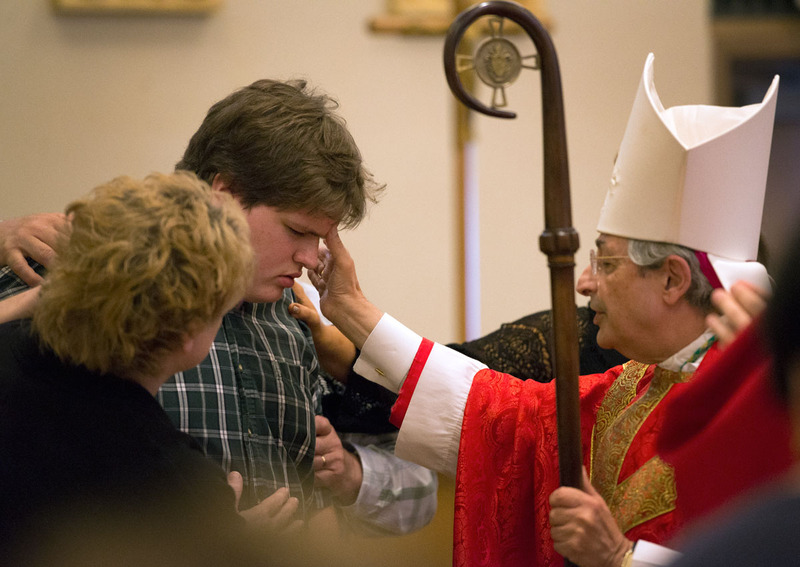 Bishop Salvatore R. Matano confirms Sean Mullen during a Mass in the Diocesan Pastoral Center chapel July 24. 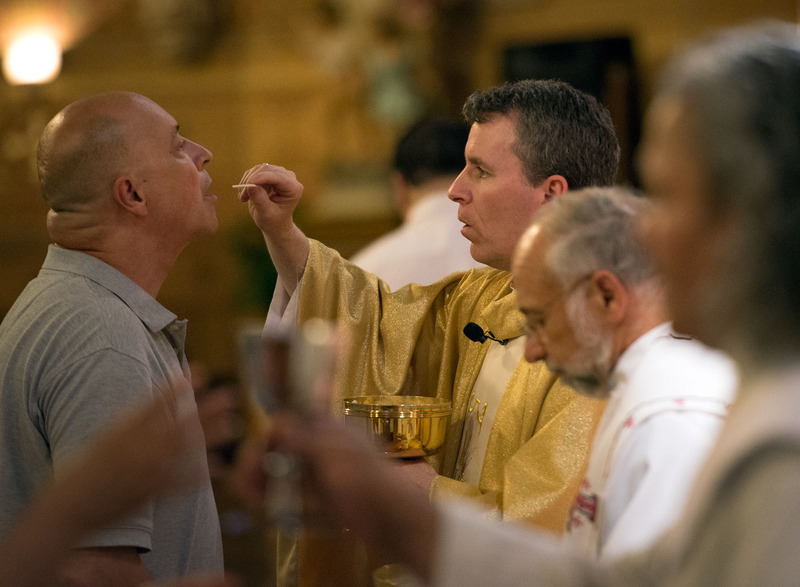 Father Mickey McGrath serves Communion during a Mass to celebrate the Nativity of St. John the Baptist June 24 at St. Michael Church in Rochester. Father Mickey McGrath celebrates a Mass to celebrate the Nativity of St. John the Baptist June 24 at St. Michael Church in Rochester. 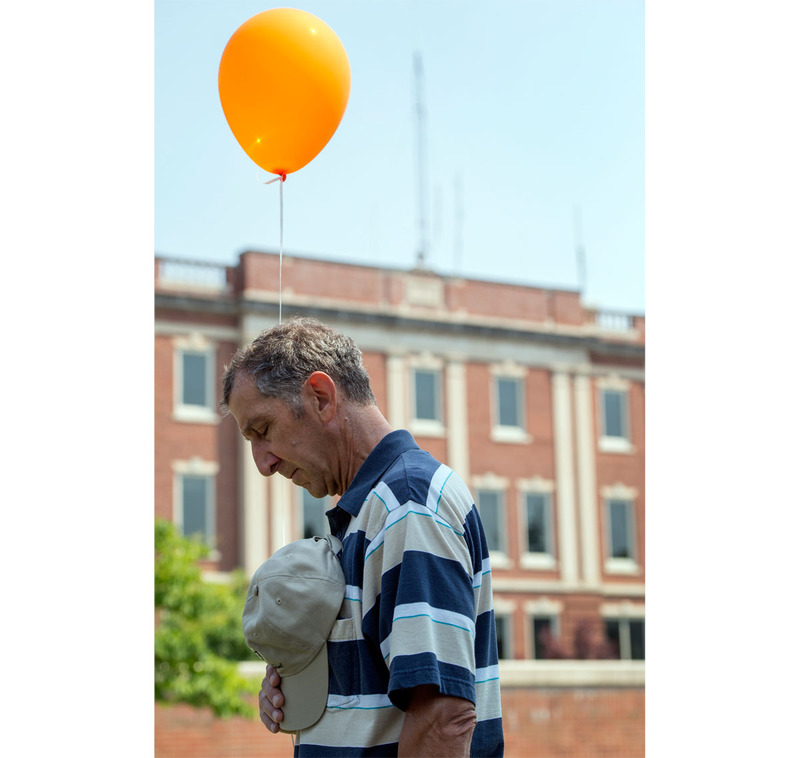 A participant in the Walk for Life prays outside the hospital in Geneva July 12. The two-mile walk through downtown Geneva was held by Care Net of the Finger Lakes. 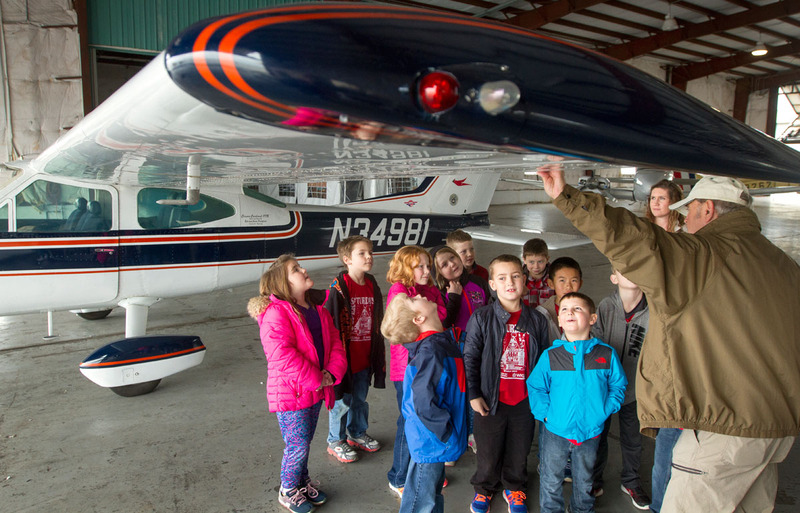 Here are my favorite pictures from assignments this spring at the Catholic Courier. 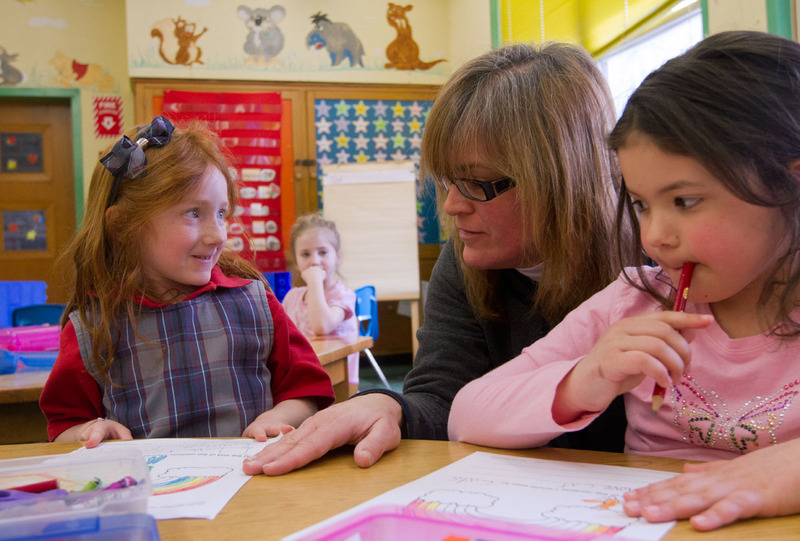 Kindergarten teacher Deborah Sindoni talks with Meghan Forbes (left) and Lauren Godkins March 21 at St. Francis-St. Stephen School in Geneva. Sindoni now teaches in the same classroom in which she was a student. 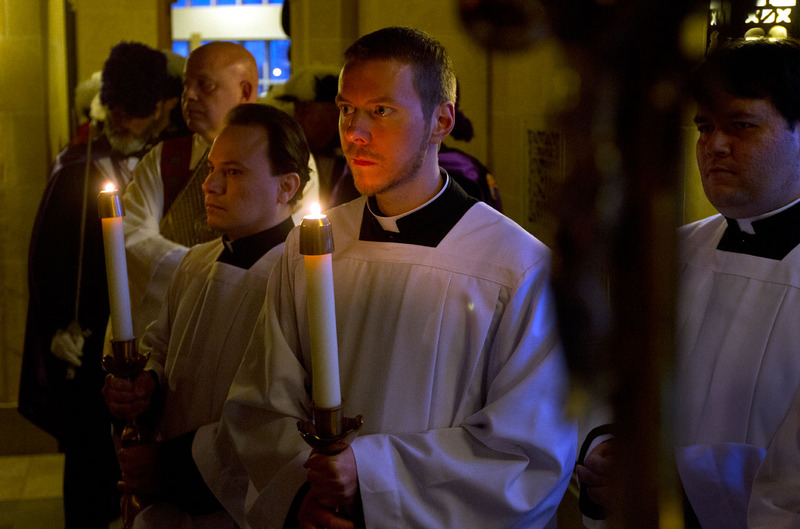 Seminarians, Camilo Aguilar, left, Justin Miller and David Fiorito wait to process in from the back of Sacred Heart Cathedral at the Chrism Mass April 15. 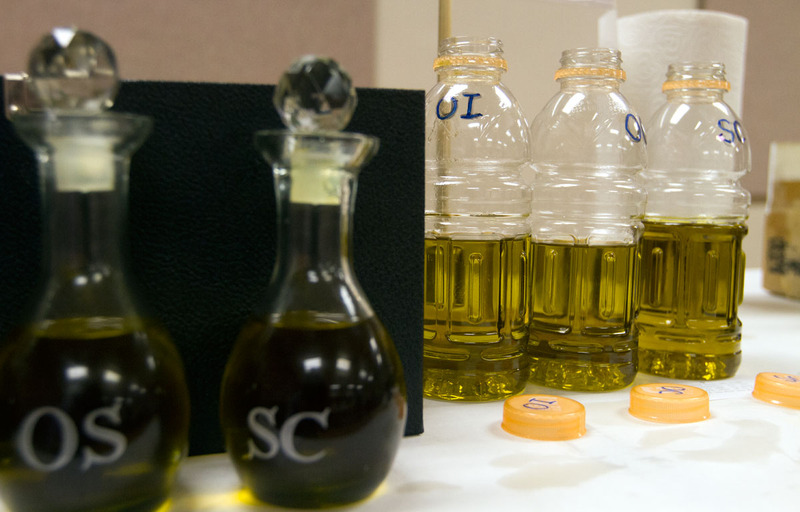 A variety of vessels and travel containers are brought from every parish in the Diocese of Rochester to receive sacramental oils at the Chrism Mass. Eric Soriano checks the blood pressure of Kenny Mussaw in the Civic Center Parking Garage in downtown Rochester Feb. 11. 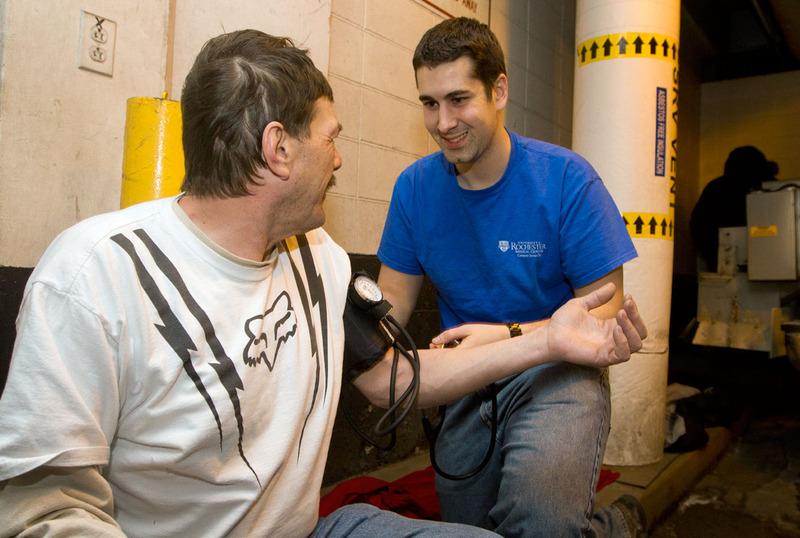 Soriano, a medical student at the University of Rochester, participated in outreach to homeless individuals in the garage with other U of R students and volunteers from St. Mary’s Church. 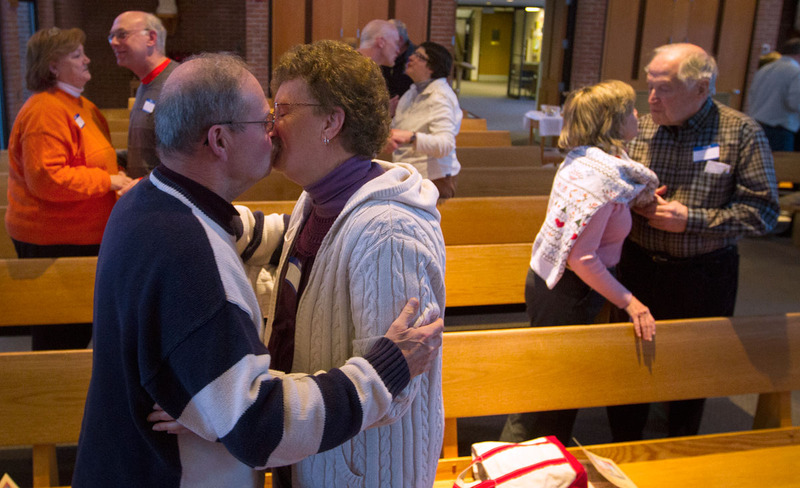 Couples kiss after renewing their wedding vows during a retreat at Notre Dame Retreat House in Canandaigua Feb. 15. 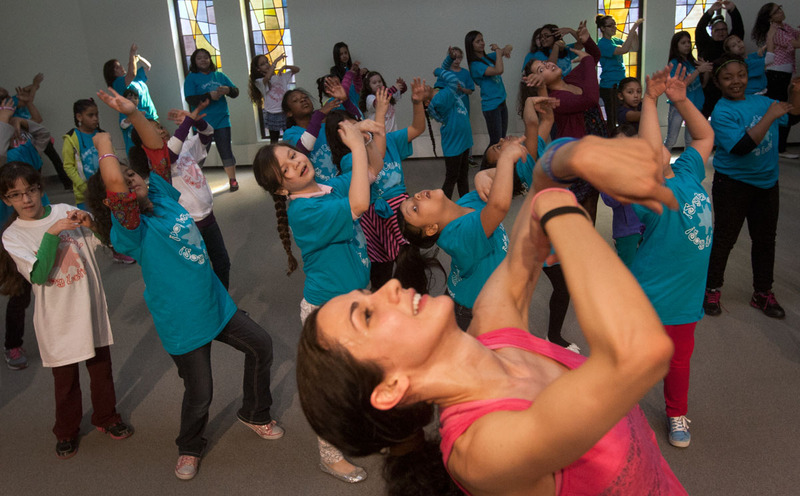 Adriana Ochoa leads young Latinas in zumba during the ÁSoy Unica! ÁSoy Latina! Rally held by Latinas Unidas April 19 at Nazareth College. 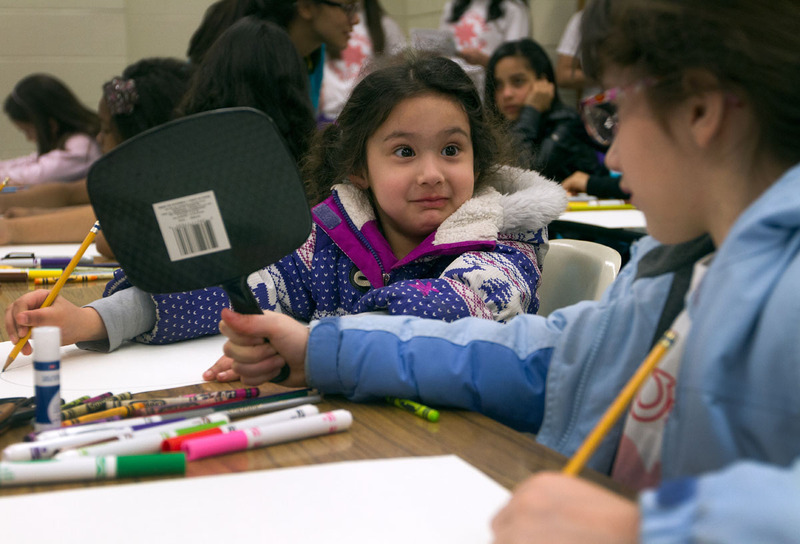 Six-year-old Alejandra Ochoa gets help from her sister, 8-year-old Adriana Ochoa, to use a mirror while creating a self portrait during a student workshop at ÁSoy Unica! ÁSoy Latina! Rally April 19 at Nazareth College. 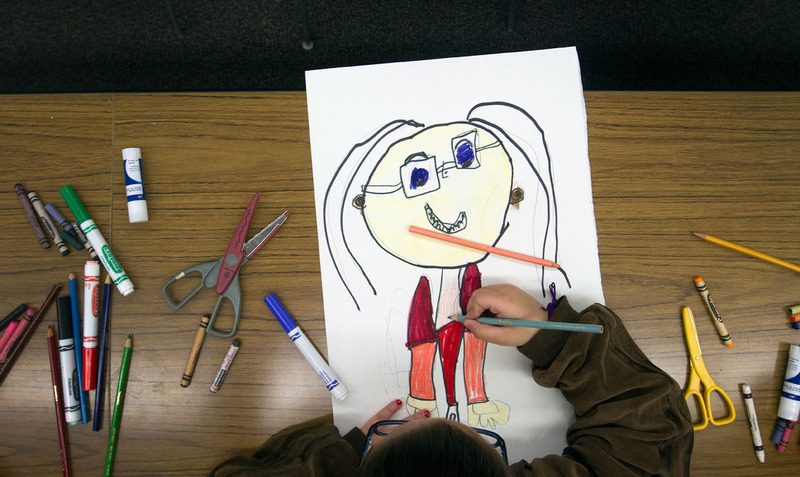 A student draws a self portrait during a student workshop at ÁSoy Unica! ÁSoy Latina! Rally April 19 at Nazareth College. 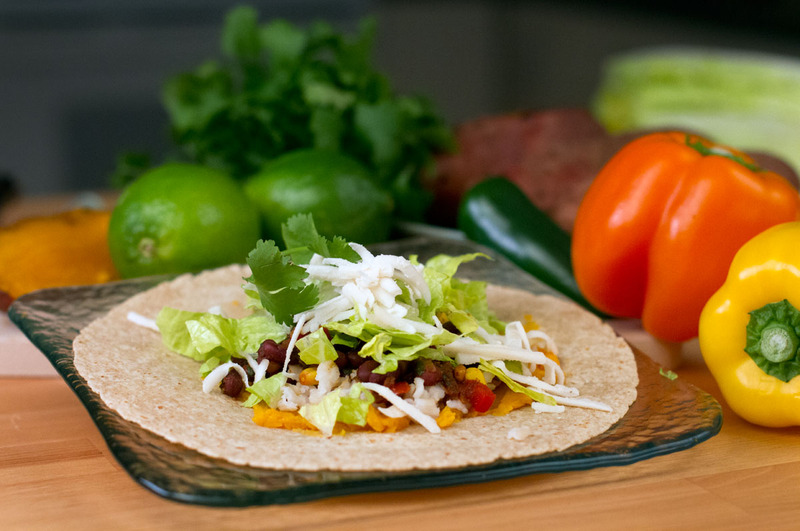 Black bean and corn tacos are a fast, easy-to-prepare option for meatless meals during Lent. 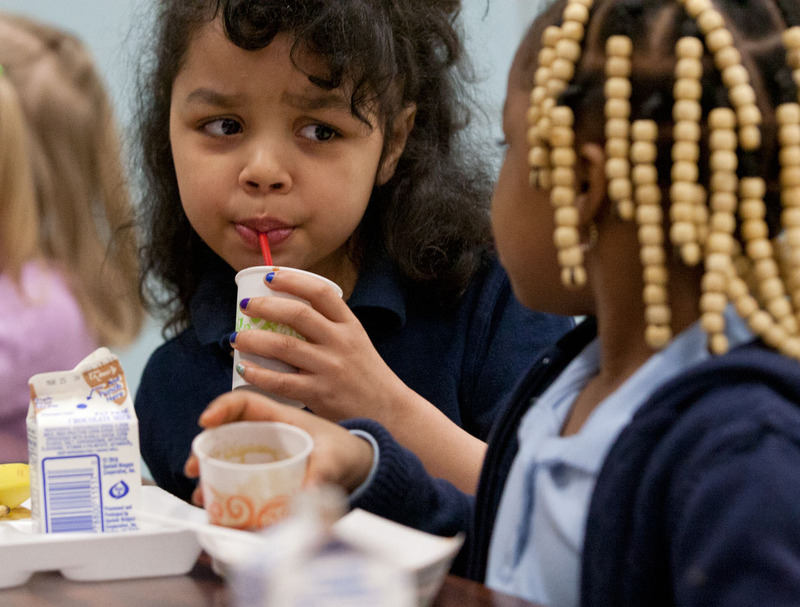 Kindergartener Gabrielle Mcbride drinks a smoothie while visiting with classmate Nakiyah Calok during lunch at James P.B. Duffy School No. 12 in Rochester March 19. 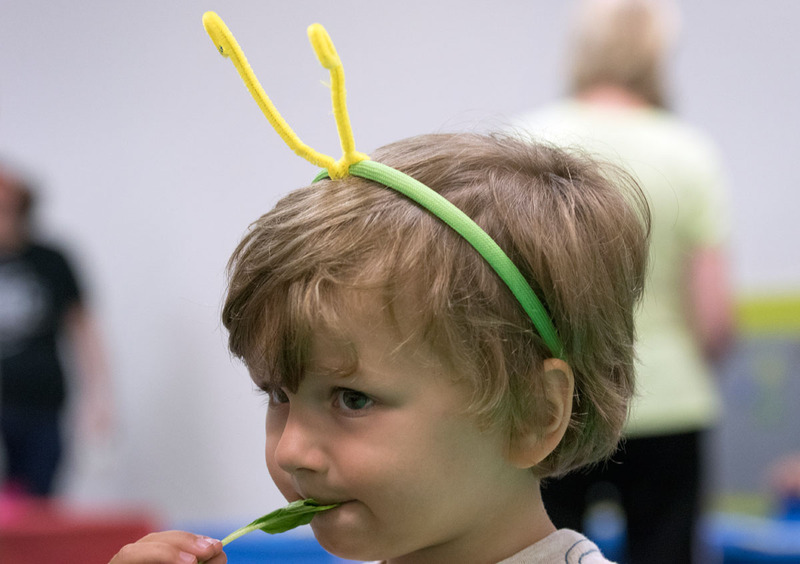 As part of the “Edible Education” program, representatives from the Good Food Collective gave students the smoothies, which were made of peaches, spinach, strawberries and blueberries. 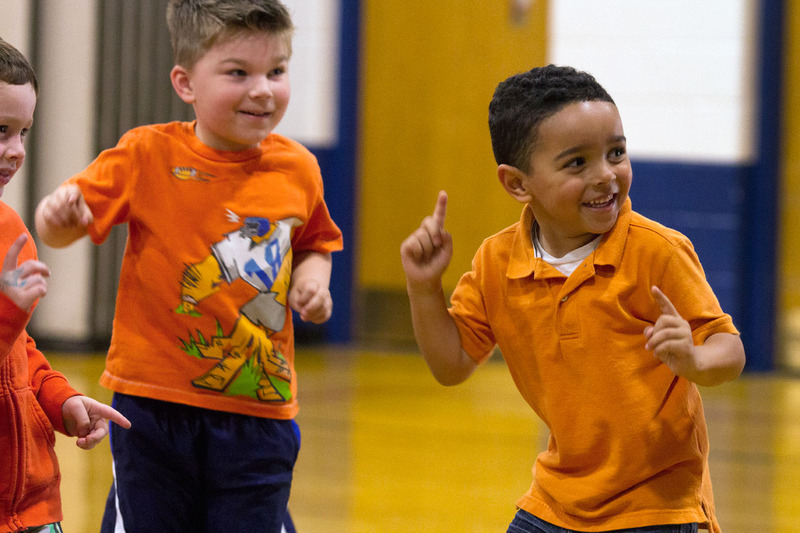 Preschoolers Daniel Wright (left) and Roman Maldonado dance to the “Hokey Pokey” with classmates. 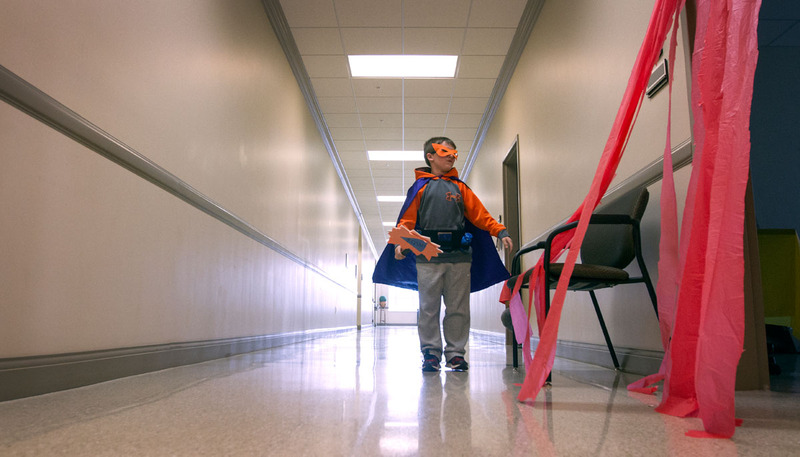 Students at St. Kateri School in Irondequoit showed support for former student Avrie Sinesiou by shooting a music video and holding a dress-down day May 14. 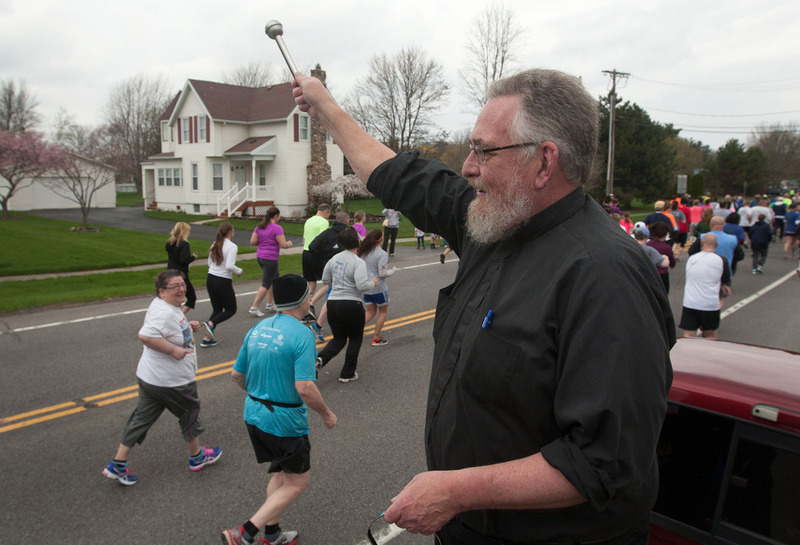 Father Dan Condon, Chancellor of the Diocese of Rochester, blesses runners with holy water as they leave the starting line of the Run for the Young 5k at St. Lawrence Church in Greece May 3. 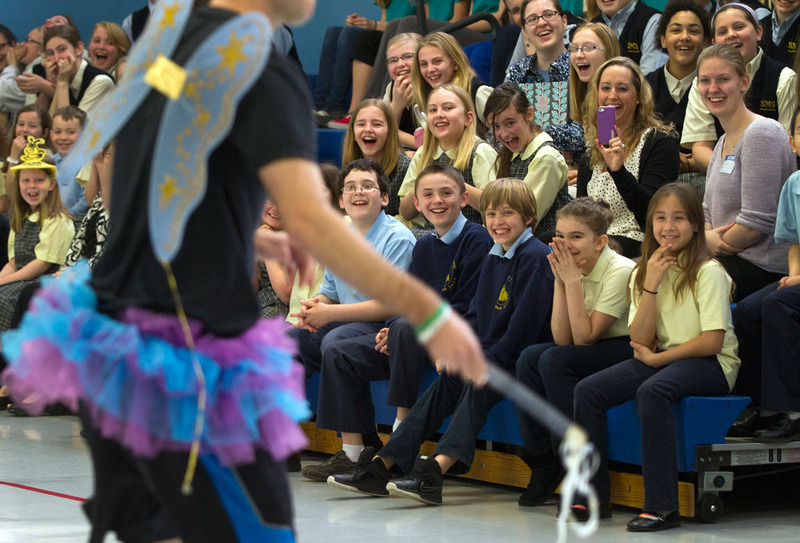 Students react as technology teacher Dan Pitnell comes out dressed in a tutu during a school assembly April 11 at St. Mary School in Canandaigua. 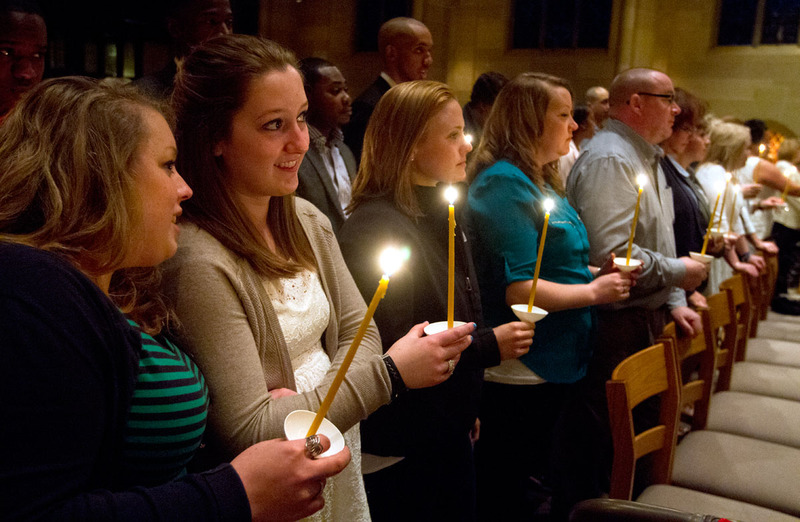 Mass-goers hold candles at the beginning of the Easter Vigil Mass April 19 at Sacred Heart Cathedral. 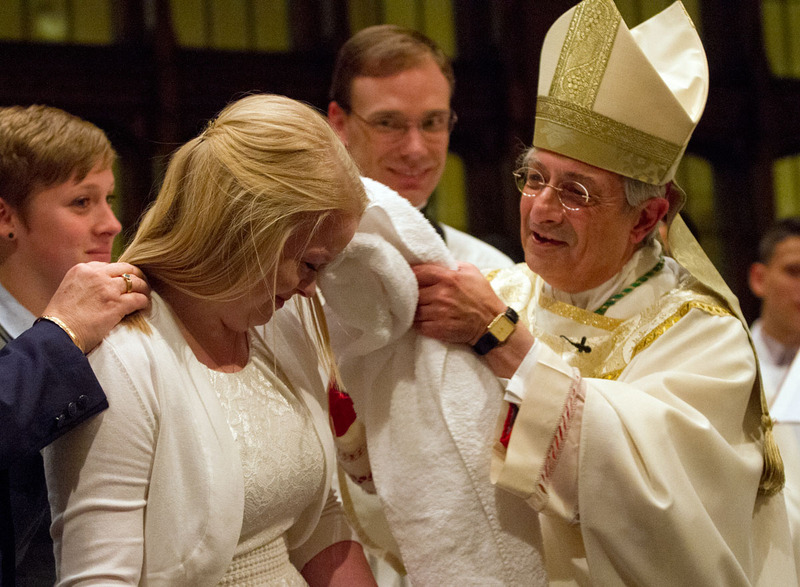 Bishop Salvatore R. Matano dries off Tina Eligon’s hair after baptizing her during the Easter Vigil at Sacred Heart Cathedral April 19. Bishop Matano welcomed 13 people into the church while celebrating Mass with the Cathedral Community. 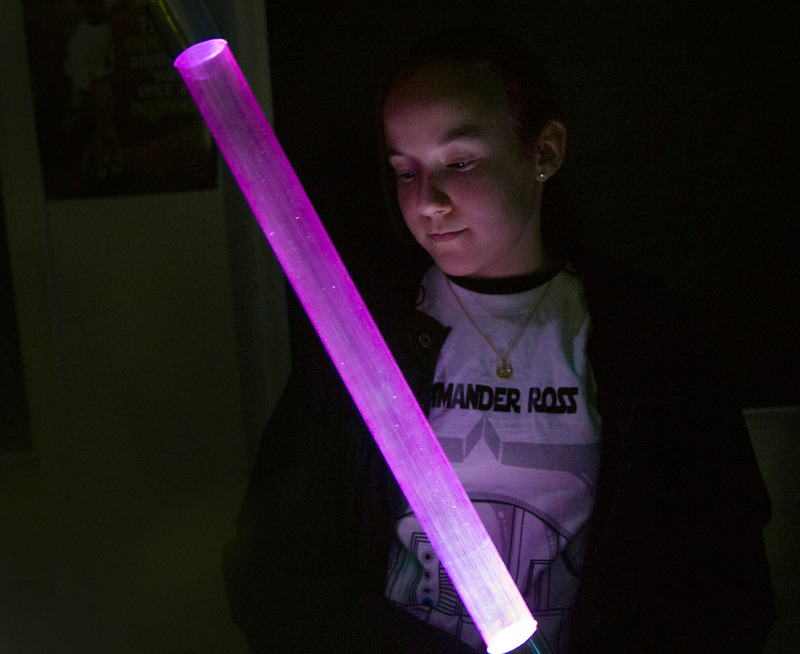 Here are some of my favorite pictures from assignments in January. Thanks for looking! 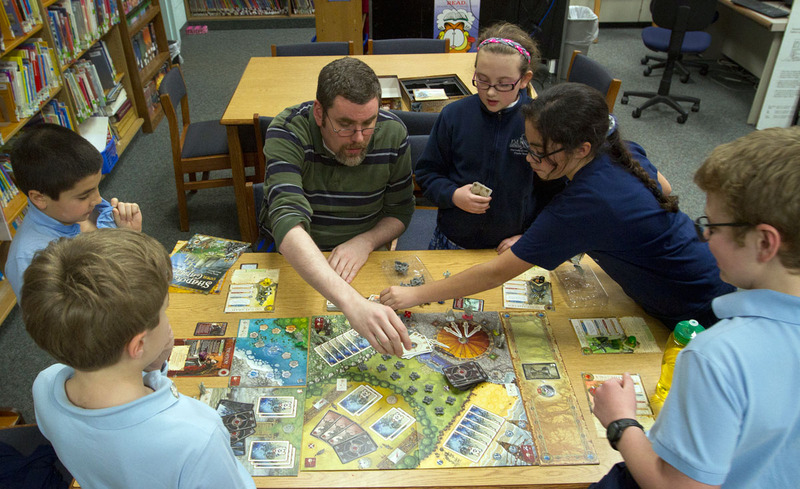 Tom Rued plays Shadows Over Camelot with a group of fifth-graders who are members of the board game club at Seton Catholic School in Brighton. 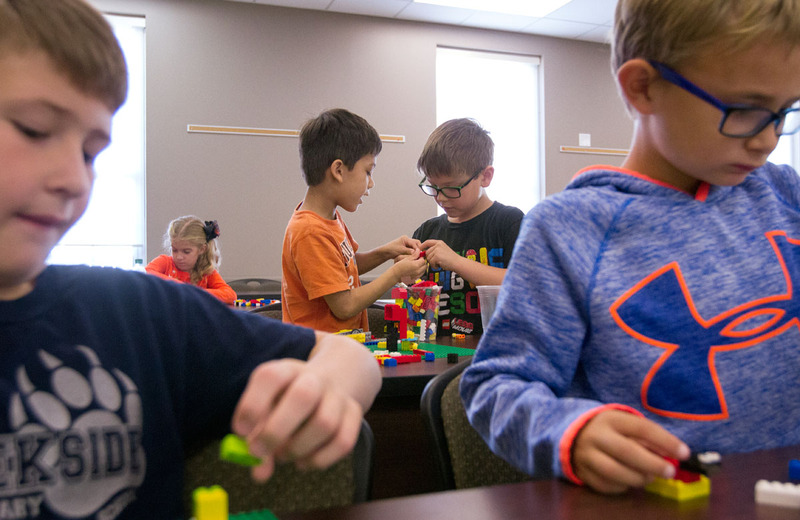 Rued, the school’s educational technology coordinator who also works part time at a game store, started the weekly after school club three years ago. 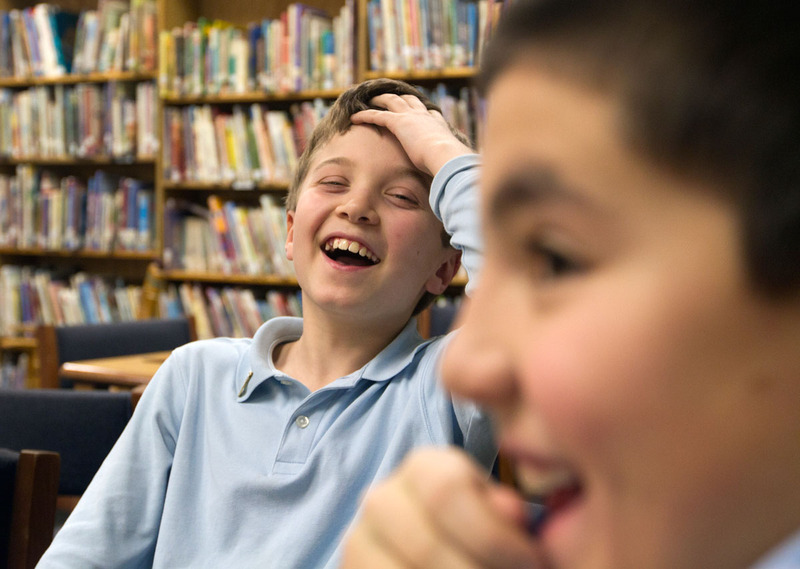 Fifth-grader Charles Laniak laughs at classmate Brenan Hain while setting up the game. 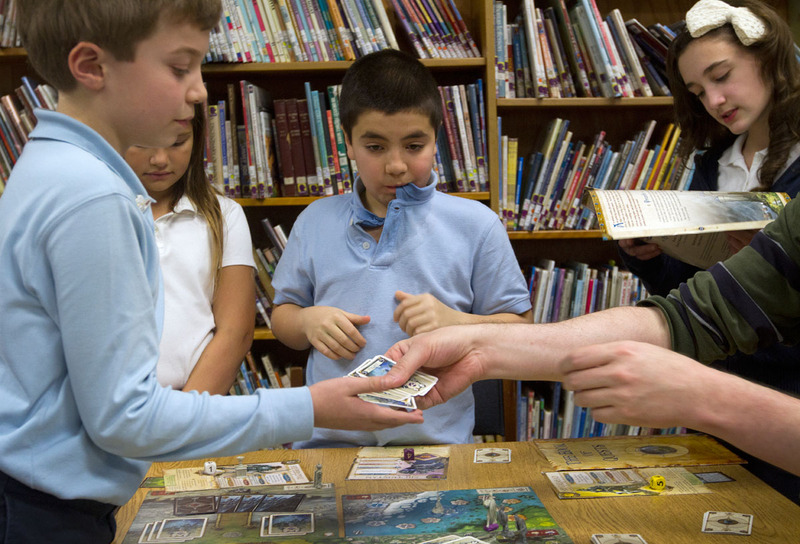 Brenan Hain (center) watches as Shadows Over Camelot is played. 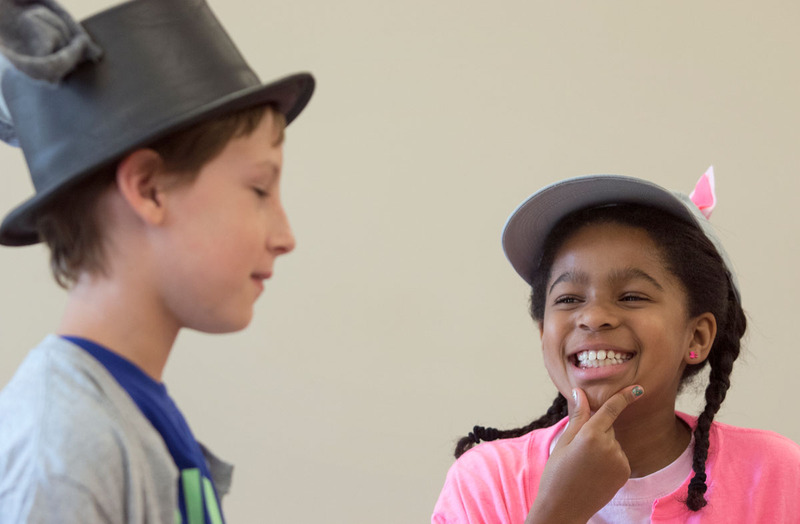 Fifth-grader Madison Brown asks Rued for some advice. Shadows over Camelot is played by completing a series of quests through cooperation by all players, who take on different roles of King Arthur’s Knights of the Round Table. 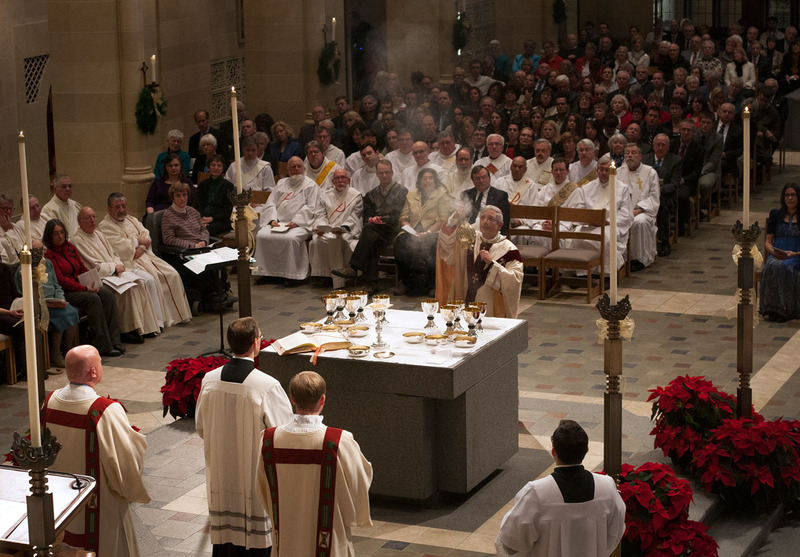 Bishop Salvatore R. Matano incenses the altar while celebrating communion during his installation Mass Jan. 3 at Sacred Heart Cathedral in Rochester. 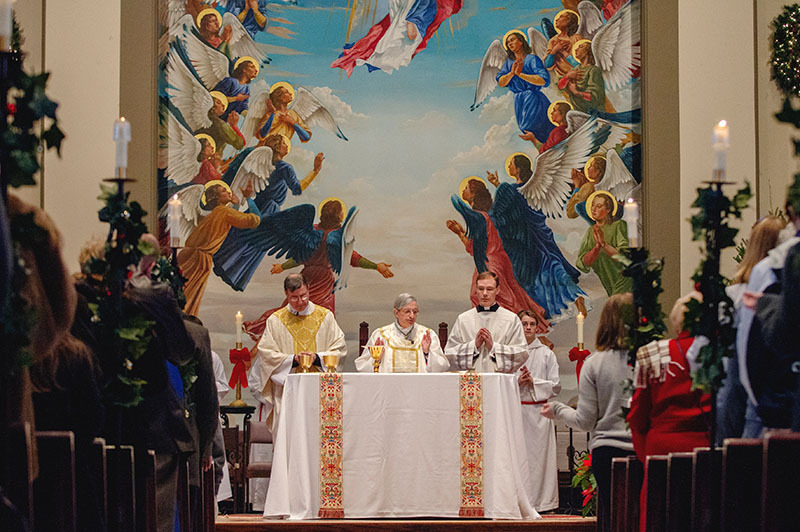 Bishop Matano celebrates Mass with Father Frank Lioi, left, and his secretary, Father Daniel White, at St. Mary Church in Auburn Jan. 5. 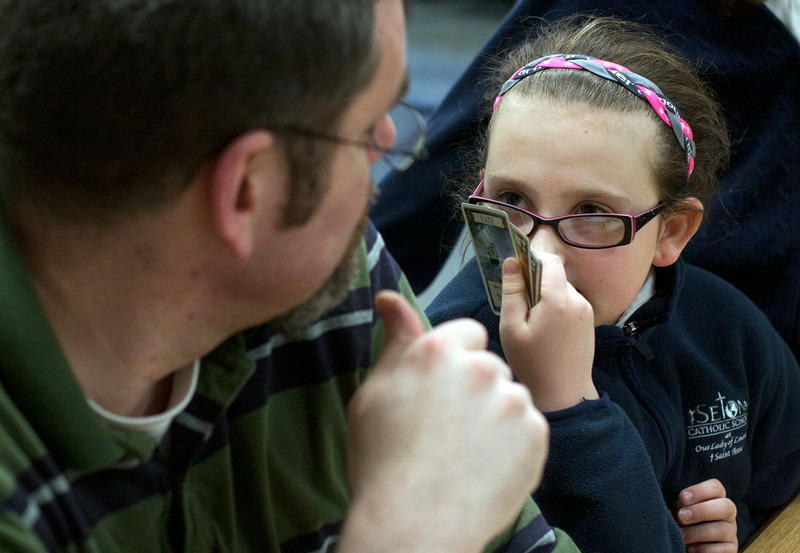 Six-year-old Clara Stoldoka of Albany talks with Bishop Matano after attending Mass at St. Mary Church Jan. 5. 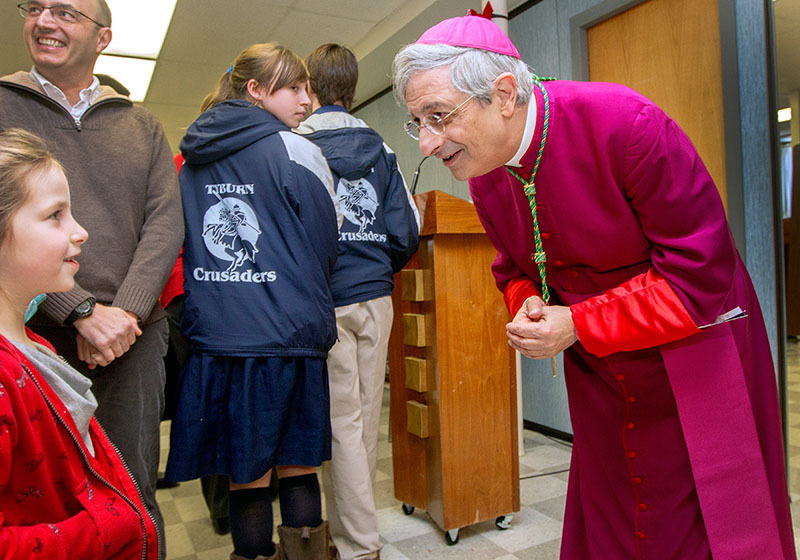 Bishop Matano visited with Mass-goers for more than an hour after celebrating his first public Mass as Bishop of Rochester. 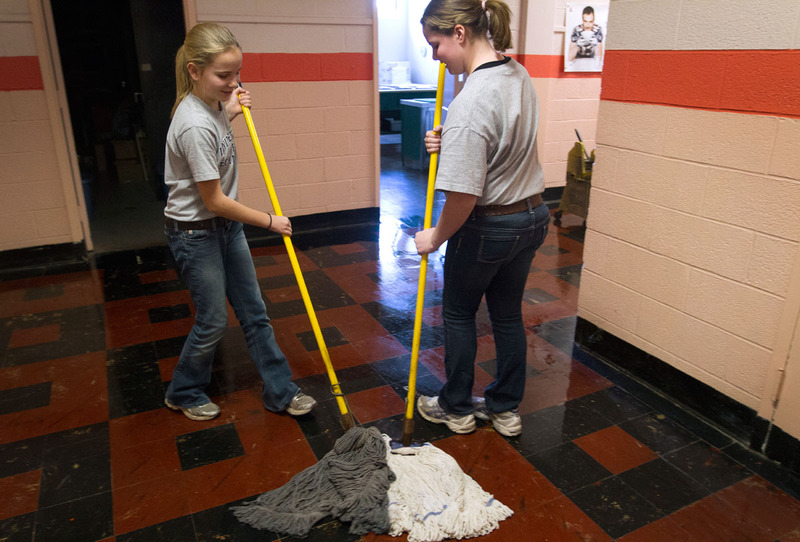 Samantha Lesch (left) and Alexandra Flurschutz mop a hallway at St. Joseph School in Auburn Jan. 30. 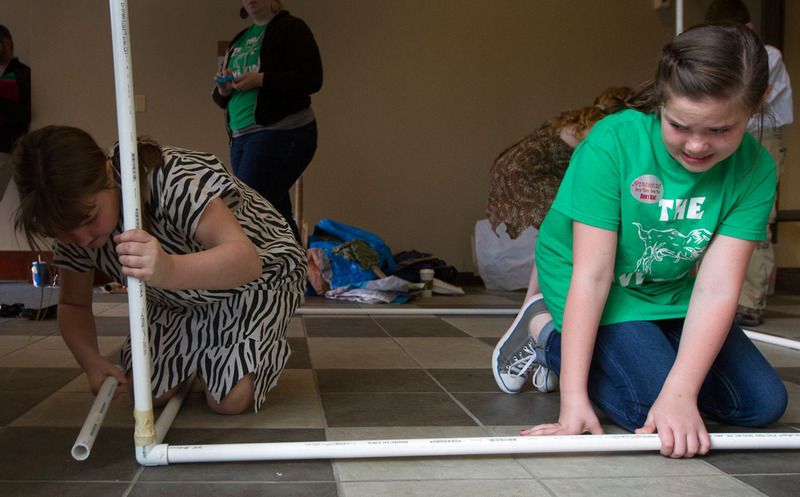 The two seventh-graders chose to be custodians on “In Our Vocations” day, during which middle school students were able to try out a variety of jobs at the school. 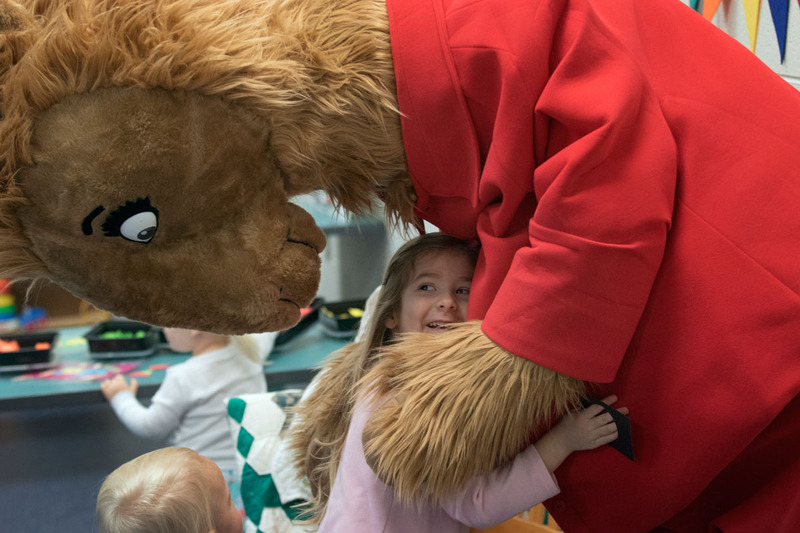 The day was part of Catholic Schools Week celebrations. 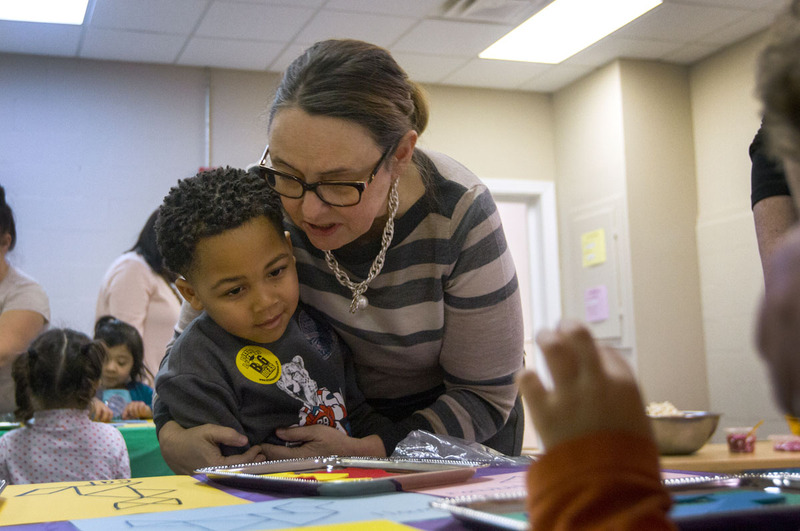 Kindergartener Maggie Scott-Blaisdell stands with Adelaide Hutson while Hutson explains the altar during a church tour at St. Alphonsus Church in Auburn Jan. 30. 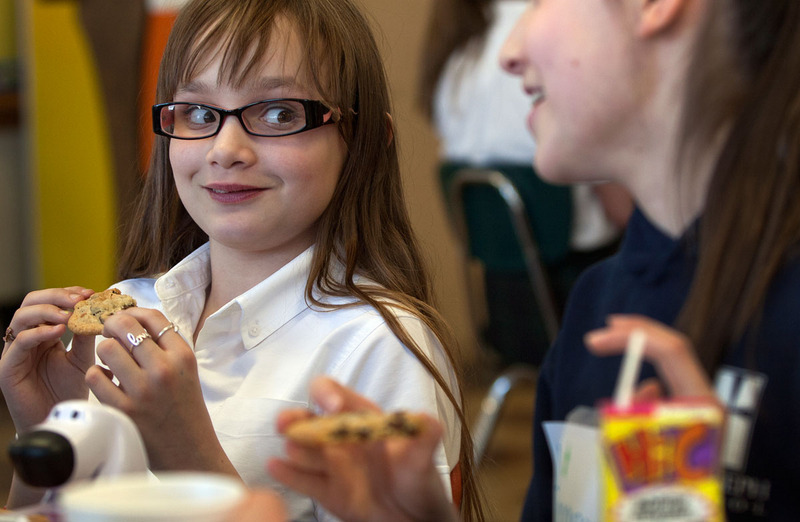 Fifth-grader Bohdana Collpelnic listens to classmate Krysha Pierce during Special Person’s day at St. Joseph School in Auburn Jan. 30. 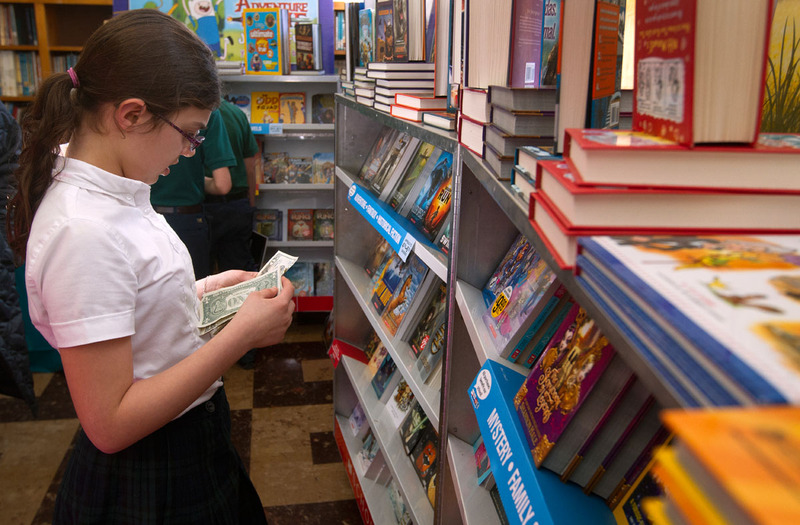 Fifth-grader Liliana Arias counts money while deciding what to purchase from a book fair at St. Joseph School in Auburn Jan. 30. Happy new year! I hope all of you, my blog readers, will have a 2014 full of unexpected blessings. 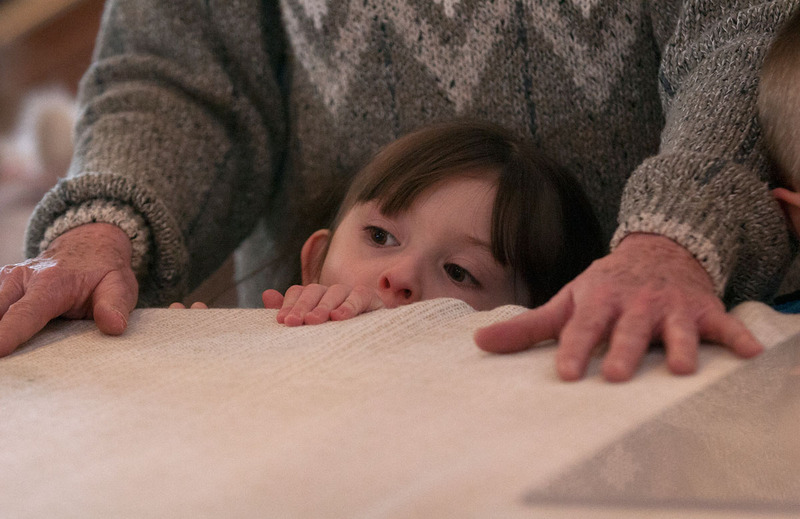 In the meantime, here are my favorite photos from December for your viewing pleasure. 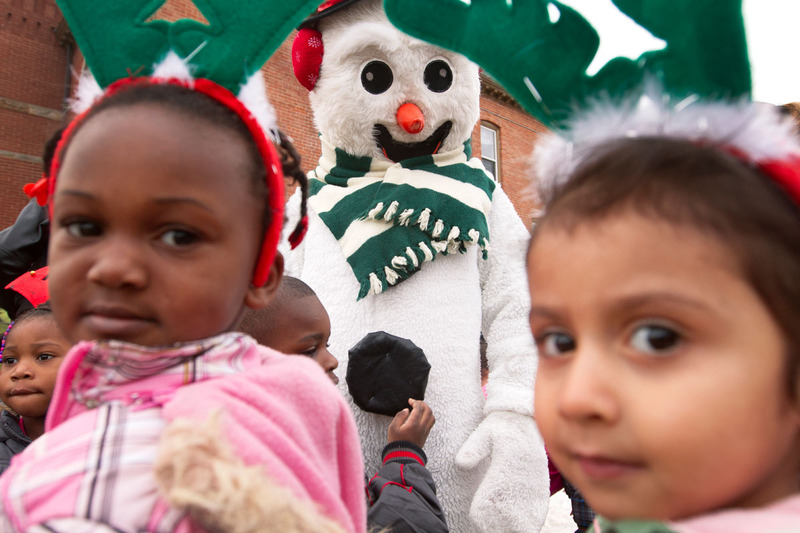 Frosty joins Santa, Rudolph the Red-Nosed Reindeer and local politicians for an annual tree-lighting ceremony outside St. Michael Church in Rochester Dec. 5. 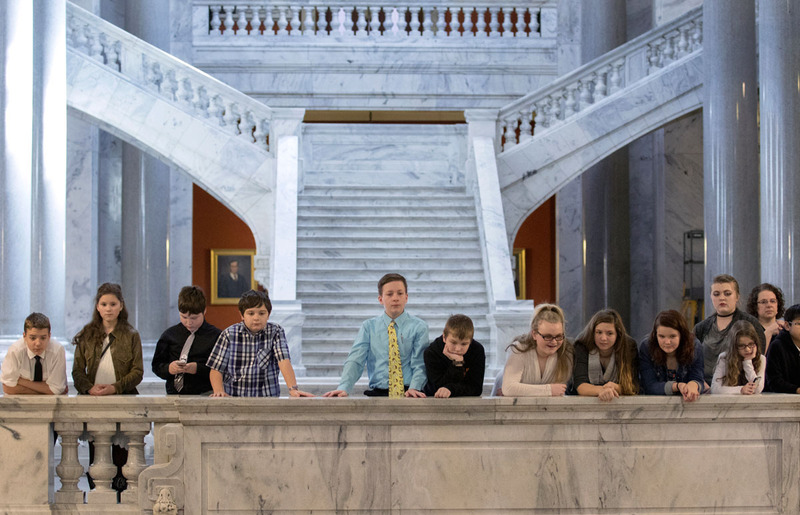 Children from a nearby child-care center and students from Schools 9 and 20 were also in the audience. 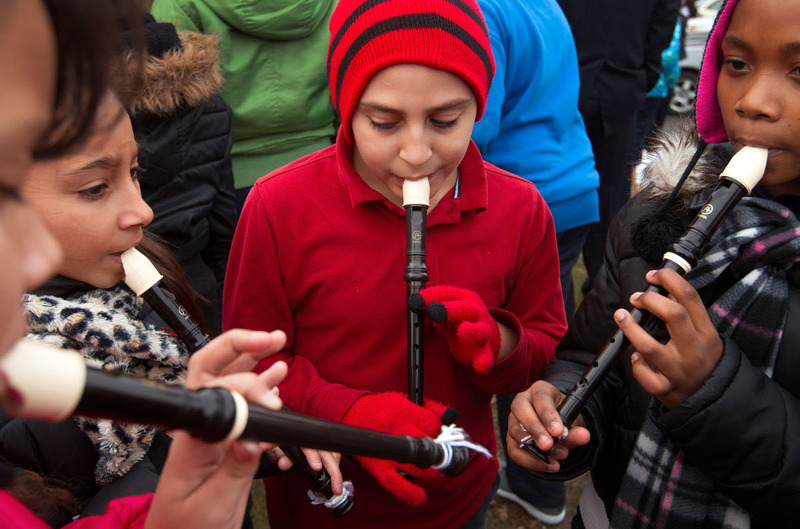 Fifth grader Jose Cruz, center, practices the recorder with classmates from School 20 before the tree lighting ceremony. 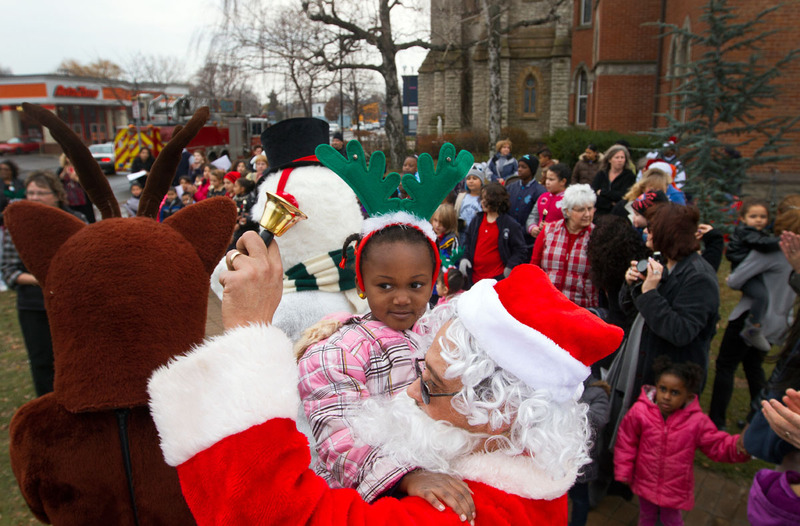 Dressed as Santa Claus, Ray Santana from Penfield holds 4-year-old Ariel Hightower during the tree lighting ceremony. 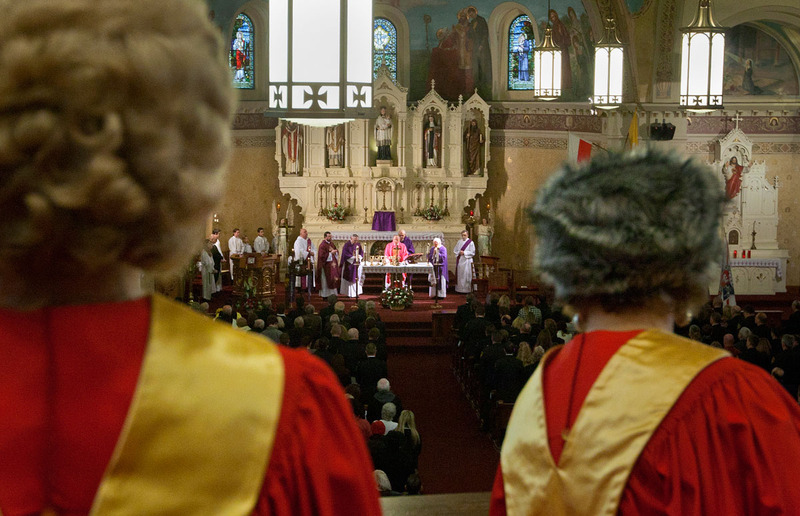 Choir members watch as Bishop Emeritus Matthew H. Clark celebrates the eucharist during Mass at St. Stanislaus Kostka Church in Rochester Dec. 15. Built in 1909, the church has a Polish heritage. 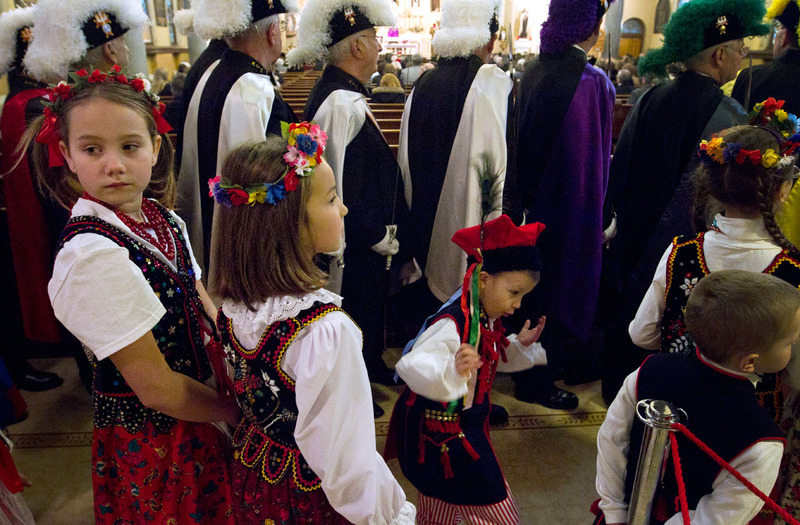 Children dressed in traditional Polish costumes line up next to Knights of Columbus before processing down the aisle at the beginning of Mass at St. Stanislaus Kostka Church in Rochester Dec. 15. 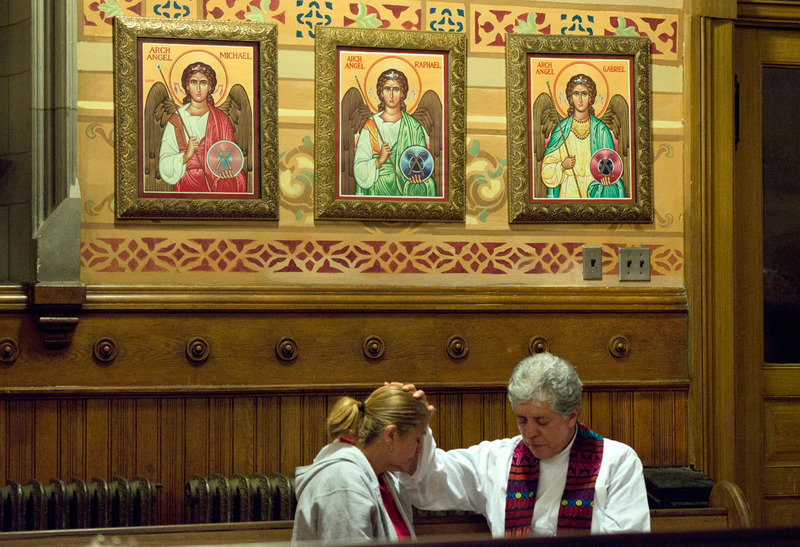 As part of the Mass, a stained glass window was dedicated in memory of Tomasz Kaczowka, who was shot and killed while responding to a fire with the West Webster Fire Department on Dec. 24, 2012. 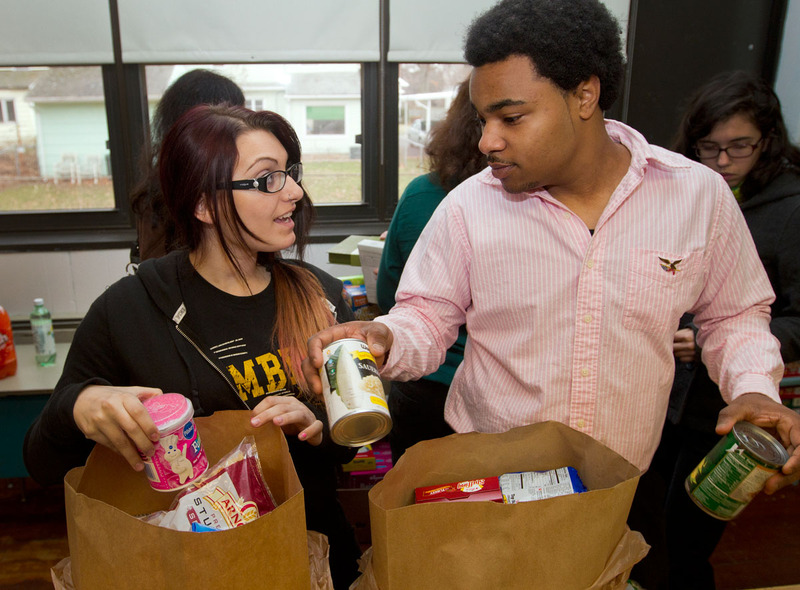 Seventeen-year-olds Toni Peggi, left, and Robert Doleman sort food into bags at St. Charles Borromeo Church in Greece Dec. 8. Parishioners expected to distribute about 75 food bags with items for breakfast, lunch and dinner to families in need before Christmas. Christmas presents picked out by Tina Louk during the Christmas Blessings project at Holy Apostles Church in Rochester wait to be brought home to 5-year-old Jonathan. 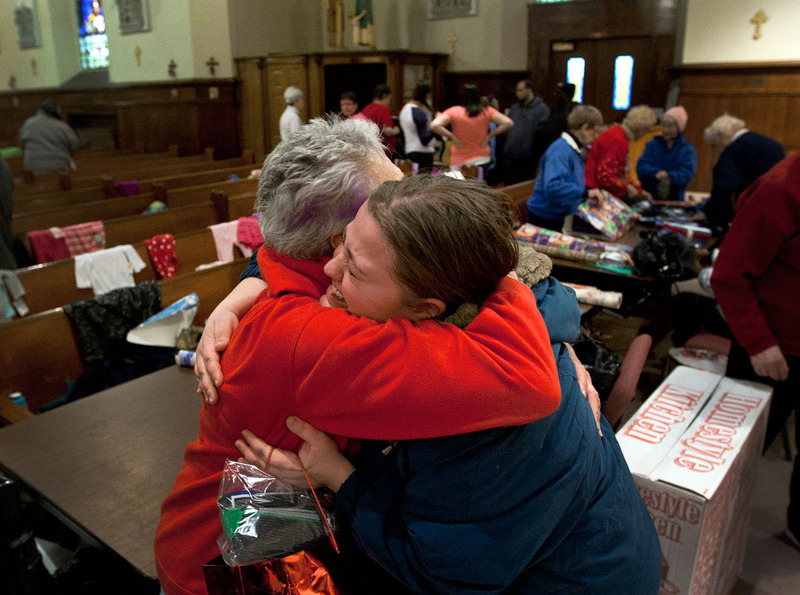 Tina Louk, right, hugs Suzanne Robinson after Robinson helped her to wrap Christmas presents she picked out for her son and other relatives Dec. 19 at Holy Apostles Church in Rochester. 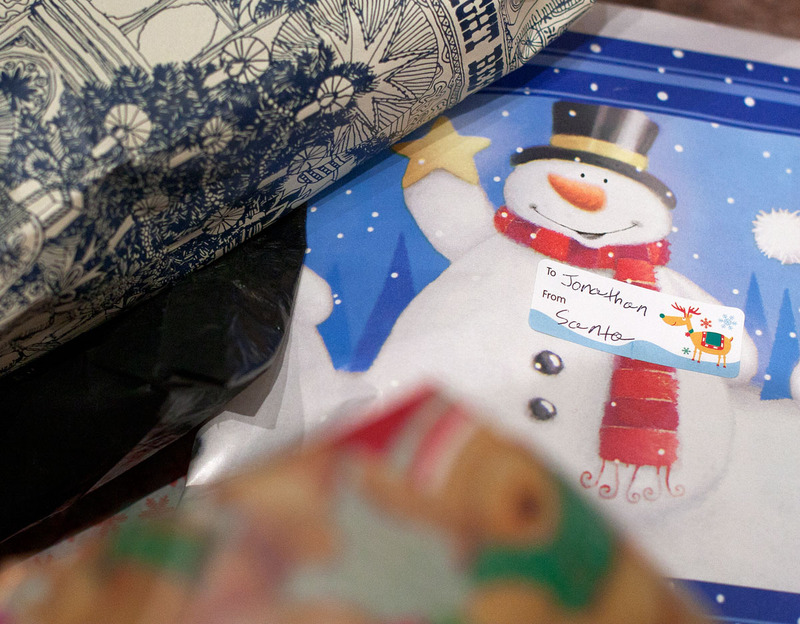 Over 80 families in need received gifts and food as part of the parish’s Christmas Blessings project.